The week of March 17th was really long. We bought our new Georgetown 328 on the preceding Saturday, but needed to get finances, insurance, and storage arranged before we picked her up. We scheduled our PDI (Pre Delivery Inspection) for Monday, March 24th, 9 days after the date of purchase. The dealership was fine with that, because it gave them plenty of time to get the unit ready to go. The business person who did our paperwork suggested that we could do a shakedown trip with a couple of comp nights at a local RV Park, and we took them up on that. That long week was a mixture of excitement and apprehension. All of our prep work went really easily. Finances were no problem at all, and we had everything we needed in place by Tuesday morning. Laura and I had already done quite a bit of research on storage back in December, and targeted the Colton/Bloomington/Redlands area due to the low cost of covered and indoor storage. It would be nice to have the coach closer, but paying 300 bucks a month for outside storage didn’t appeal to me at all. Having the coach way out in the eastern boonies isn’t bad for an escape point either…that way we are doing all of the nastiest city driving in a small Honda Accord instead of a large Motor Home. One other great thing….the dealership is about 3 miles from the storage yard, so it will be easy to get over there for maintenance or warranty work. We did some quick research on the insurance that the dealership offered us. It was exactly what we needed for a good price, so we told them to go ahead and set it up. Bottom line, we had everything in place by mid week. The apprehension I was feeling was due mainly to RV forum posts I have read over the last year about new RV quality problems. There were also a lot of posts about dealerships that tend to be less than helpful – including some posts about the dealership that we bought our coach from. There’s lots of negative stuff out there. You read story after story of a long list of defects, repairs that keep your new baby in the shop for weeks at a time, and dealers who are not responsive. All of this made me pretty paranoid. Of all the major dealers in our area, there were less negative stories out there about our dealer, and since this dealer is also the largest, I figured that was a good sign. I created a check list of things to look at during the PDI. It had 100 items on it! I cobbled it together from some check list examples available on the internet, and things we saw while we were sitting in the coach as sale paperwork was being done. I also put together a “PDI” kit – with a flashlight, a digital multi-meter, a DVD, a CD, and a few other items that could be used for testing various items. I put those in one of those reusable grocery bags, so I could carry it into the coach easily. Missing CD/DVD/Stereo Player head – it’s removable like many car stereo units. Nasty looking black spot on the carpet right behind the motor compartment cover, between the driver and passenger seats. 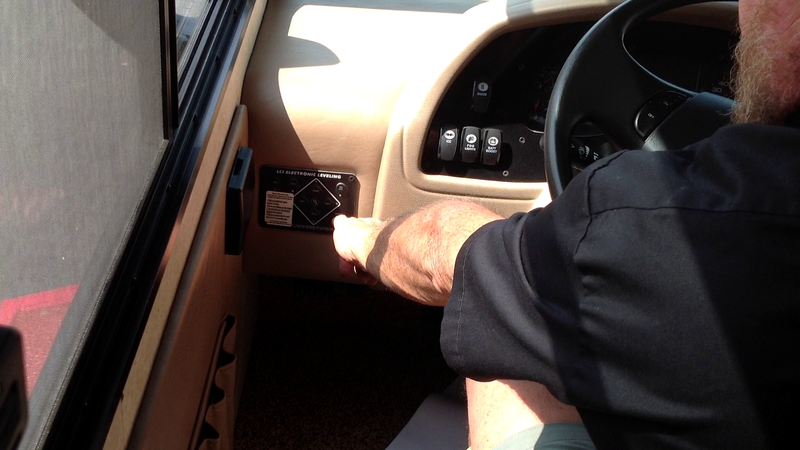 No manuals in coach – most dealerships we went to had manuals already there. Screen on window above kitchen counter either misaligned or broken. I had also read mixed reviews on the residential refrigerator/battery/inverter set up, and tried to find that equipment while we were in the coach. No luck. I was concerned for a reason. 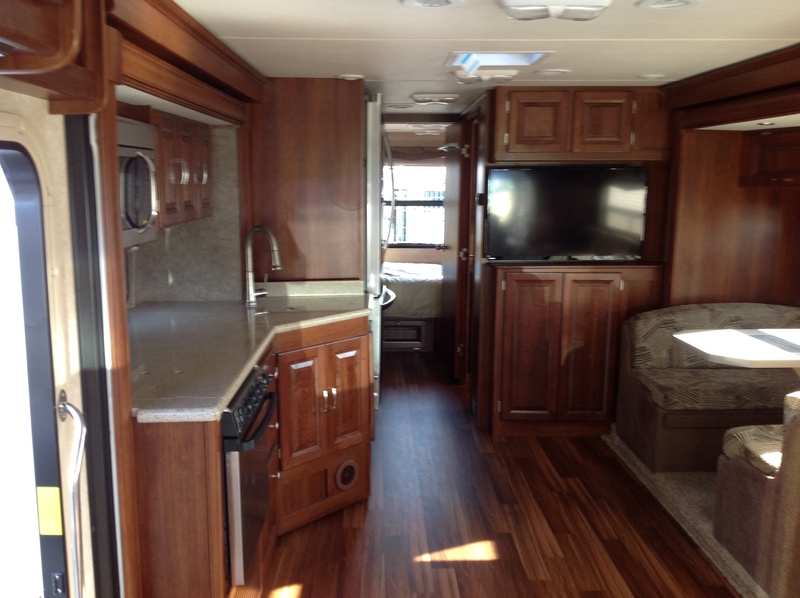 There was a long thread on one of the RV Forums about somebody who had picked up this exact model Georgetown last year. The refrigerator wouldn’t run on batteries, with the coach engine running or not. It would only run on shore power or the generator. He discovered that the factory had left off the inverter! This guy was pretty handy and didn’t want to wait around for service at the dealer, so he had Forest River send him the inverter and installation kit. I don’t blame him there….why didn’t the dealer notice something as major as this? It took this guy less than an hour to install the inverter. No problems after that, according to him. The tension built as Laura and I drove the 60 miles or so from our house to the dealership in Colton. I decided that the best thing to do was let the tech run through the normal PDI presentation first, and then use my checklist to remind me of things that weren’t covered. I was a little worried about having the dog with us too…..I wanted both Laura and I to be able to pay attention during the PDI. I was afraid that the dog would get nervous and be a problem for us. As it turned out, she was perfect. No trouble at all. We had her with us because we were going from the dealership straight to the campground for our shakedown. Right before we left home, I got a call from or salesman, Matt. He said that he had to be in Fountain Valley for another PDI, and he was going to turn ours over to another person at the dealership named Stephanie. That made me a little nervous too. And to top it off, we underestimated the traffic, and were running about 15 minutes late. Laura called Stephanie from the car and let her know we were running late, and she said she’d be watching for us. The dealership is part of an RV “Mall” in Colton. The three biggest dealers in So Cal were on that street, along with some other RV related businesses. Our dealer was second on the street. We pulled into the parking lot, gathered up the PDI kit and the dog, and started walking towards the entrance. Stephanie was out there next to a golf cart, and waved to us (do we look like your typical RV buyers?) We walked over to her and introduced ourselves, and then piled into the golf cart for the ride out to our coach. Stephanie was a riot – very bubbly. She and Laura hit it off right away. I was still a bundle of nerves, so I didn’t join in the joking around too much. By the way, this dealership is pretty big. It was nice not to have to walk over to the PDI staging area. 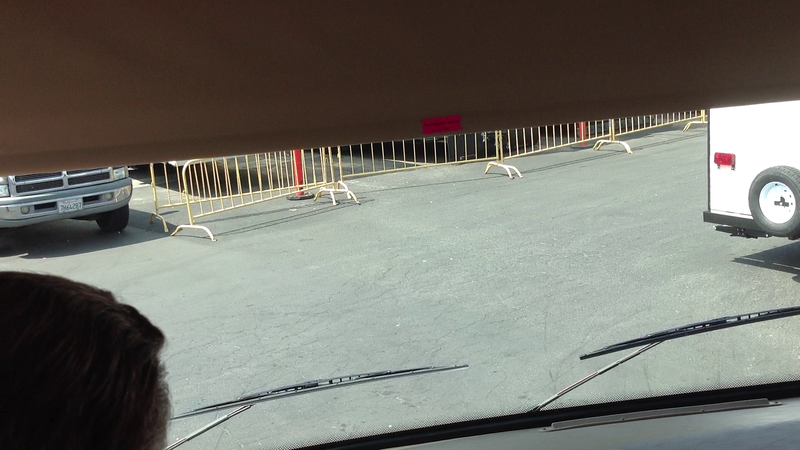 When we arrived at our coach, it was parked front out, and there was a red carpet along the passenger side! Kinda cheesy but fun. 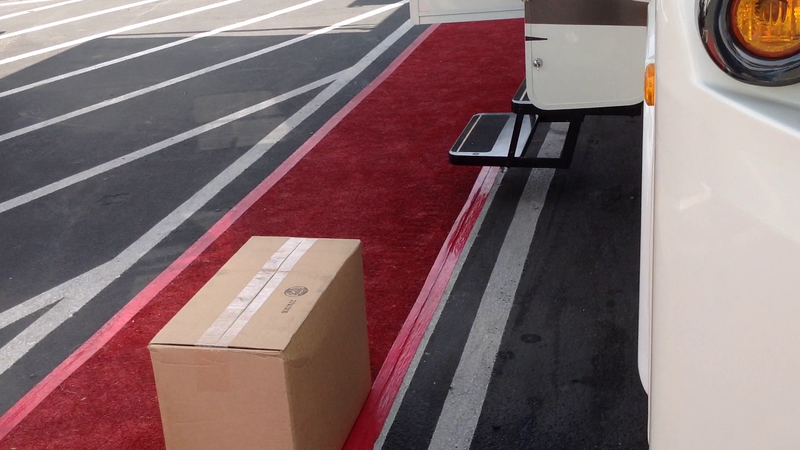 Red Carpet with goody box. The tech who was assigned for our PDI was sitting in the coach watching the TV. The awning was out, and there was a big box of goodies by the door. When he saw us walk up, he came out of the coach and introduced himself. He was a little bit older than Laura and I, and had that So Cal “drawl” that is part country, part hippy, and part surfer dude. The tech is an RV’er himself, and a former teamster who drove truck for many years. He had a easy charming way about him, and it was pretty obvious that he enjoyed what he was doing. We started on the outside of the coach, at the front passenger side wheel, and worked our way to the back, and then up the drivers side, and to the front. The tech did a great job on this, explaining each item and compartment. 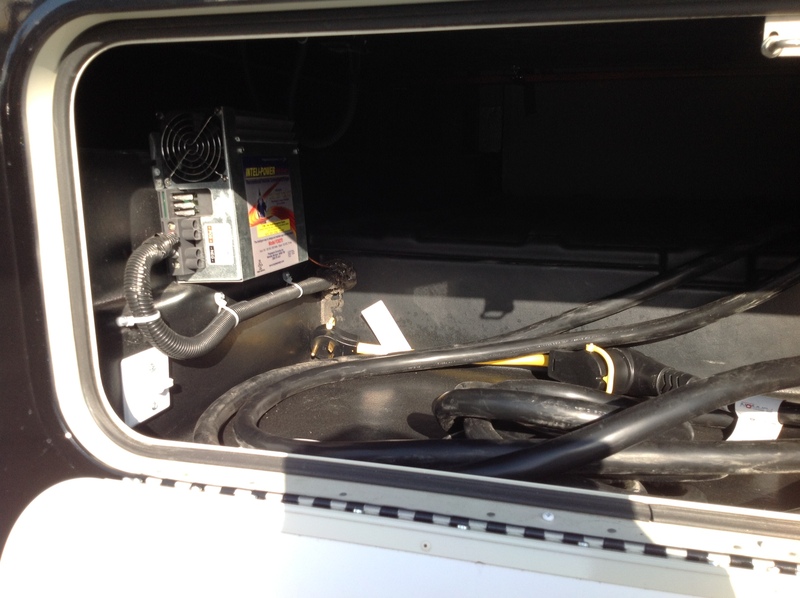 The dual house batteries and inverter were both on the passenger side – and it’s no wonder that I didn’t recognize them. Forest River puts a black fiberboard sheet in front of sensitive stuff like the inverter, water pump, and hydraulics for the leveling jacks. There are two white round screw in covers in the fiberboard, about 5 inches in diameter, that can be unscrewed to allow access. If you just open the compartments, which look like storage compartments while closed, you only see the fiberboard and the round access covers, and they aren’t labeled. The tech showed us how the entire panels could be removed should any serious work need to be done to the components behind them. Then he laughed and said if he ever had to take them off he’d probably never put them back on. I actually like the extra protection, personally. Cover over inverter with access holes. 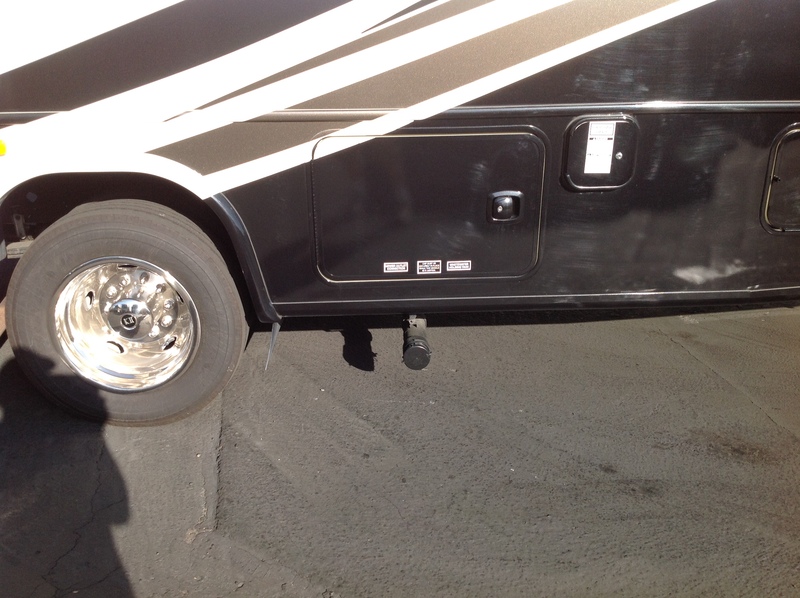 As we got to the back, Laura noticed that something didn’t look right with the 7 pin trailer connector mounted to the tow bar. Sure enough, it was broken. The tech made note of it, and arranged for it to be repaired. According to the forums, this happens all the time on 2013-2014 Georgetown 351s and 328s. 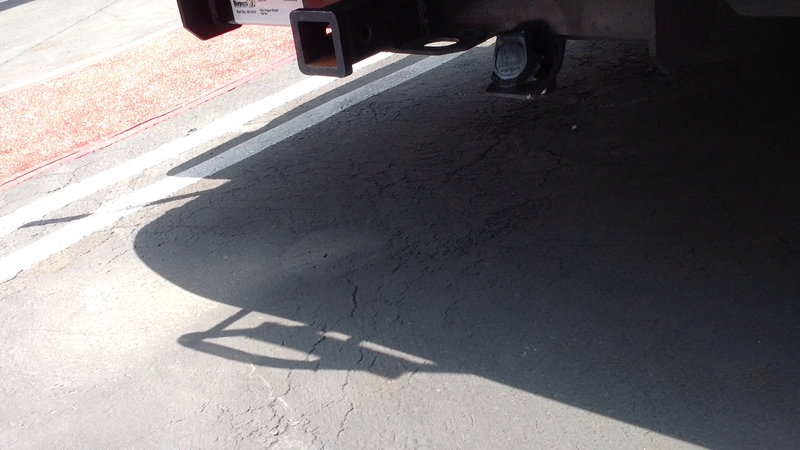 The metal retainer for the connector is on the bottom of the tow bar, and if you are pulling into or out of a steep driveway (like many gas stations have) it takes a beating. Good catch by Laura on this one! One of the posters on a forum thread about this said he was going to have the bracket moved from the bottom to the top of the tow bar. That would solve the problem. I might even just take the connector out of that holder and zip tie it to the top…..we’ll see. I don’t want to have to pay to have that connector replaced when it gets nailed again, and I don’t want it getting broken while we are towing, either. The bent 7-pin connector housing. The plastic part of the connector is actually broken, but you can’t see that here. 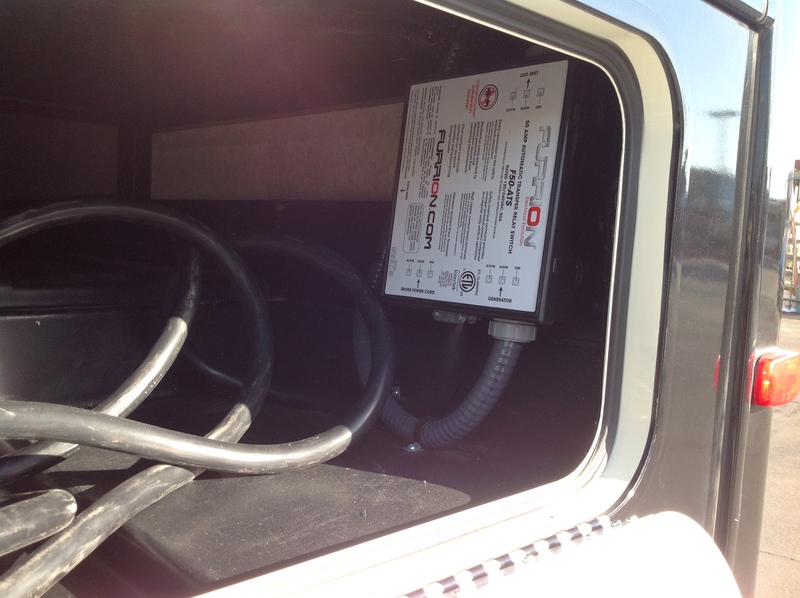 On the drivers side, we started with the 50 amp electrical service, which was plugged into a pedestal already. He showed us the auto switch that changed the coach over from shore power to generator and back again, and also the converter, which allows the shore power to charge the coach and chassis batteries. 50 Amp cable coming out of the back of the coach. The converter and auto transfer switch are in here. Next was the water and sewage compartment. This was pretty typical, but unlike most coaches I’ve seen, the holding tank outlet comes under the coach, rather than terminating inside the compartment. I think I like that better, because if there is an “oops” it’s not going to dump waste inside your compartment. 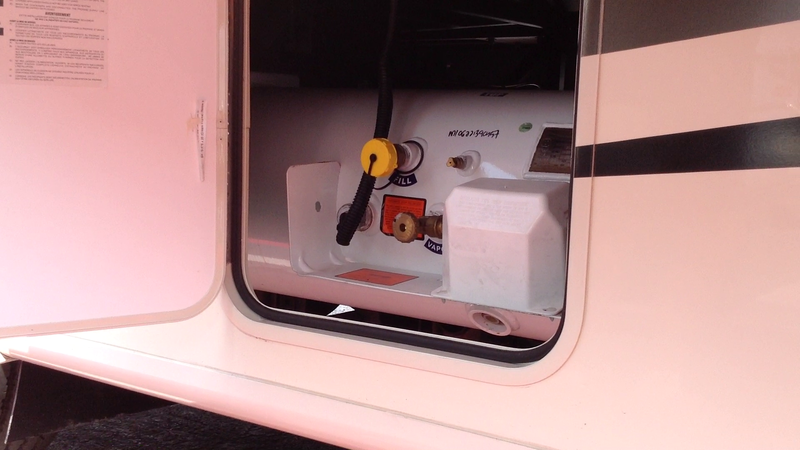 The compartment door can be locked after all the connections are made. Good thing. I’ve read about a prank that teenagers like to do with the sewage systems. If the cap is still on the sewage outlet, they open the black tank valve. The guess what happens when the owner opens that cap to attach the sewer hose! I’ll be sure lock our compartment, to avoid karma for all of the outhouses that my friends and I pushed over when we were 16-17……..
Here’s where we noticed the second problem. There is a housing for a water filter in this compartment that is supposed to come with a removal tool. They put the wrong tool in, and it didn’t fit. We were provided with a correct tool, but I didn’t get to try it out until after we were at the camp ground. I tried to use the tool, and still couldn’t get the housing off…..it’s a little too tight, although after reading the instructions, I think I know why I was having trouble. More on that in another post. Filter Housing wrench too big! Past that were some more storage compartments, and then the generator. 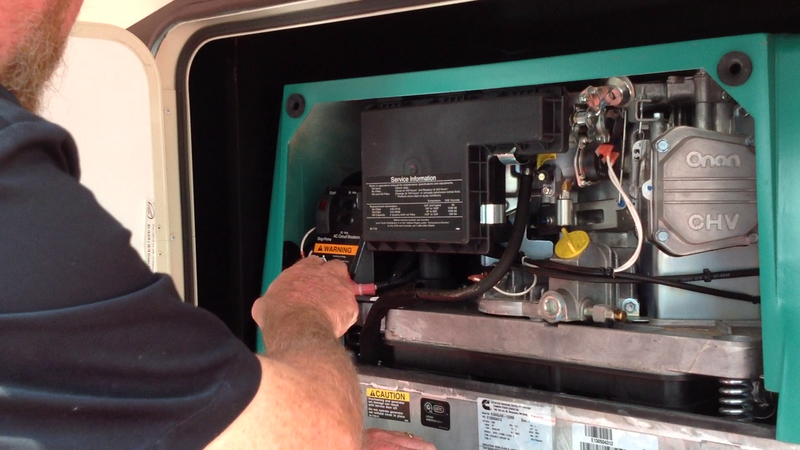 The tech removed the cover and showed us where the oil fill, check, and drain was, and how to start the generator from there. He mentioned that it can also be started from inside the coach. 5.5 Generator with cover removed. 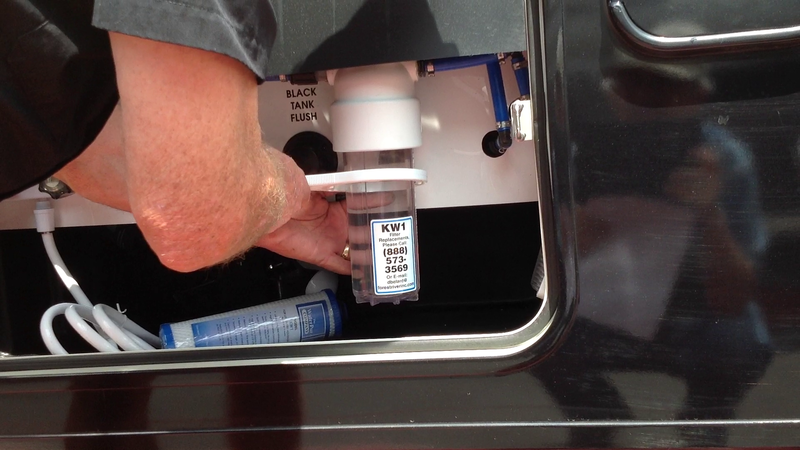 Next was the propane tank – he showed us the shutoff and fill valves, and told us that it was full. He mentioned that the gas tank was full as well. 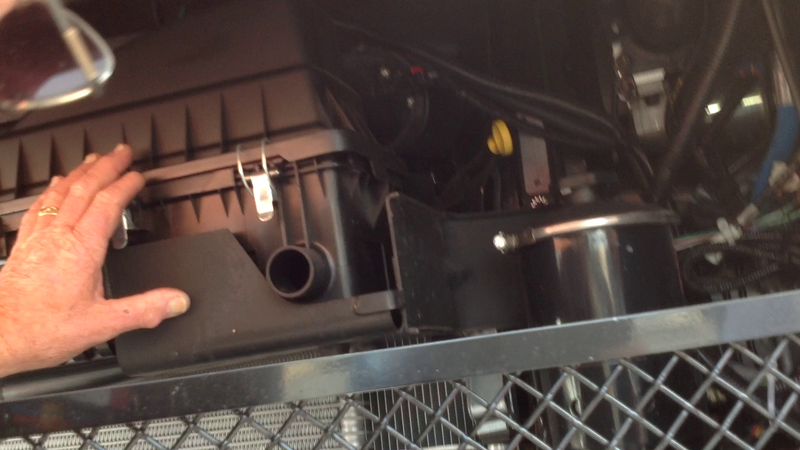 Around front, we opened up the engine compartment and he showed us where the dip sticks, fluid fills, and filters were. 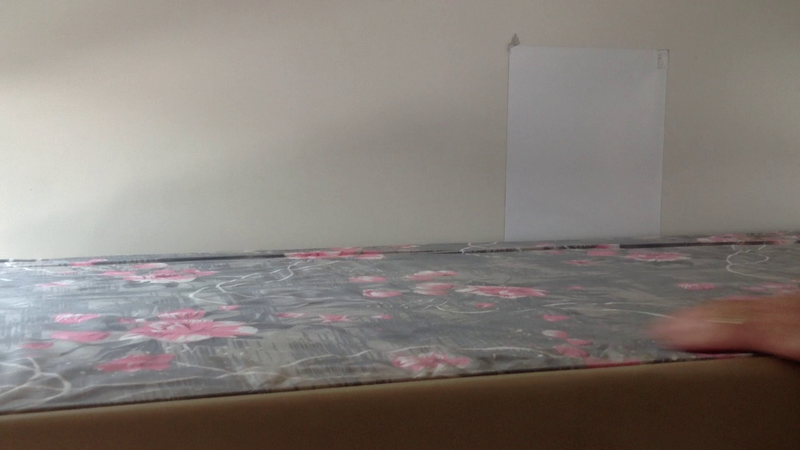 It’s going to be interesting trying to pour oil into this…not a lot of room. I took a look under the coach in several spots. Very nicely painted structure down there. Wire and tubing bundles were all fastened against the frame – nothing dangling or loose that I could see anywhere. We entered the coach and then worked from the passenger seat back, around the back, and up to the driver’s seat. The first things I looked for as we were starting were the problem items I listed. CD/DVD/Radio head unit was installed. The black spot on the carpet was cleaned – I couldn’t even tell where that was. The screen on the window over the kitchen counter was fixed. There was a big pile of manuals on the dinette table. The microwave turntable plate was still missing, but Stephanie mentioned that they found one and would have it at the coach before we left. All of this made me feel very much at ease. Missing Microwave turntable. We got one before we left. 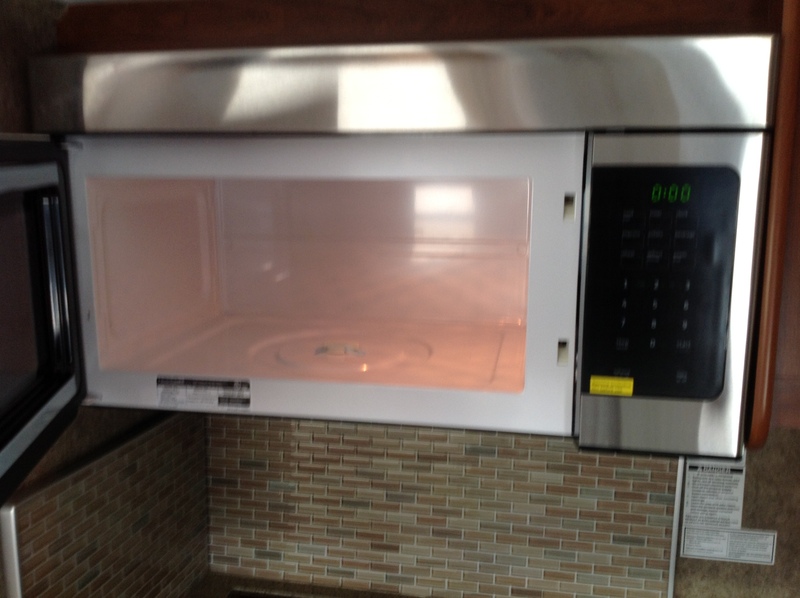 Nice Microwave – house sized. The inside demo went just as well as the outside demo. The tech ran us through each system in detail. Right after the Microwave was the stove. He uncovered it and showed us how to light a burner. This coach has an oven in it as well. We were happy about that….hard to cook a pizza in a convection microwave. This is the only thing in the coach that has a pilot light. The tech suggested that we light the pilot right before we are going to use the oven, and then turn if off afterward. That will keep us from wasting a lot of propane, and it’s safer too. It’s easy to light with one of those long fireplace lighters, which was included in our goody box. 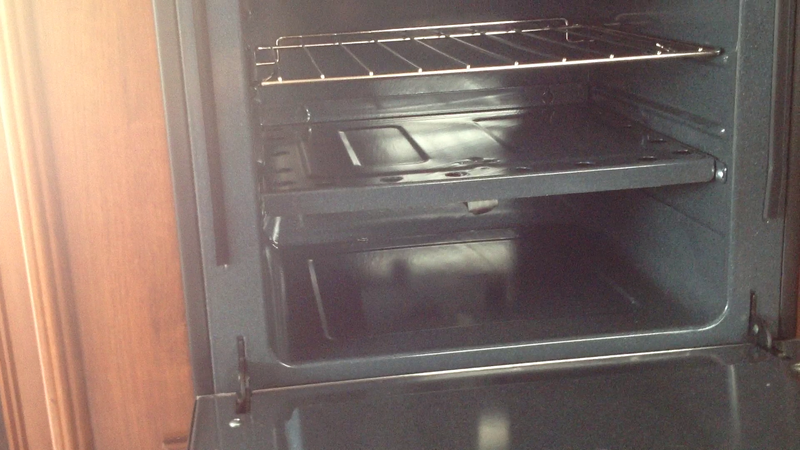 Oven….pilot light underneath the sheet metal shelf. 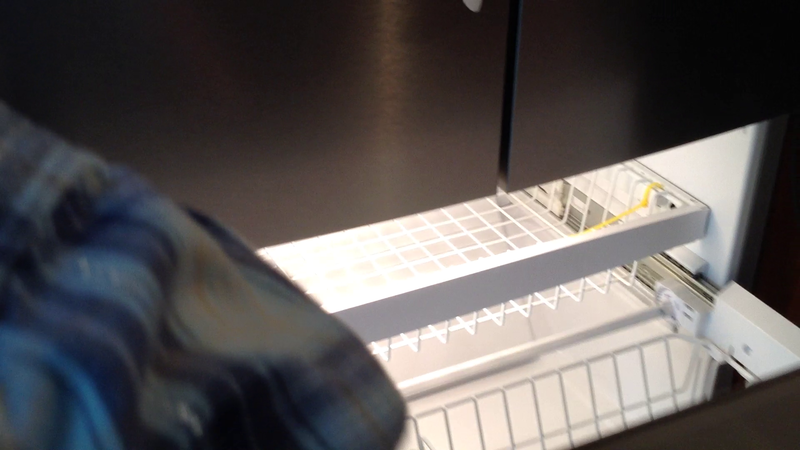 Next was the sink – and hot water/water pump test. The coach didn’t have city water attached, so the water was being pumped out of the fresh water tank. We love the freezer in this thing. It’s huge! 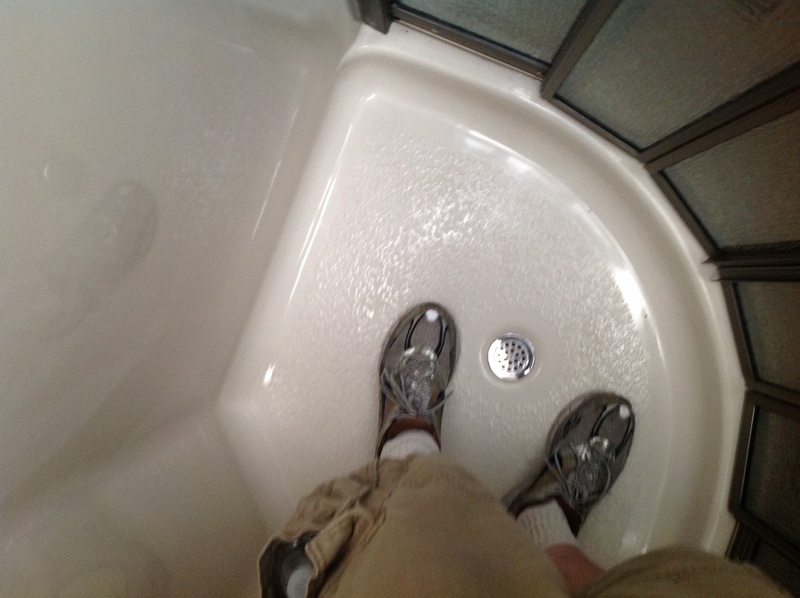 This unit also has water and cubed or crushed ice in the door, just like at home. Freezer. It probably holds more than the one we have at home. There are two thermostats in the coach. 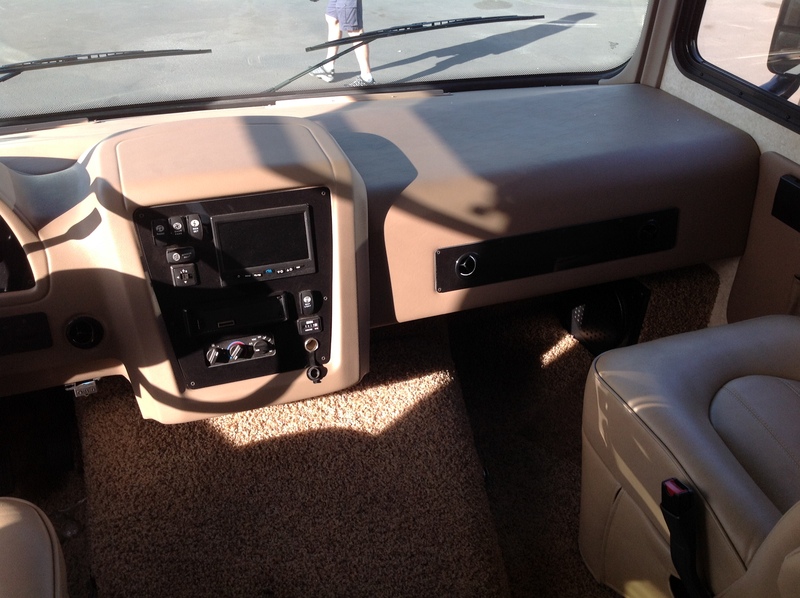 One controls the air conditioner and furnace in the front half of the coach, and the other controls the units for the bedroom area. It’s easier to use than the unit that was in the rental. There is a command center in the hallway just before you enter the bedroom. It has the buttons for the slide outs, also the water pump, the water heater, and a system called Arctic Pad which will heat the holding tanks if it’s really cold out. There are also level indicators for battery charge, holding tank levels for fresh, grey, and black tanks, and propane level. Everything appears to be working. The couch in the salon is a convertable, very similar to a home model. It works the same way. Queen bed. It can be made and stowed, which is nice. A lot of the coaches have either jack knife sofas or air mattresses. Sorry about the grainy picture – it was the best I got. Probably was moving around too much. 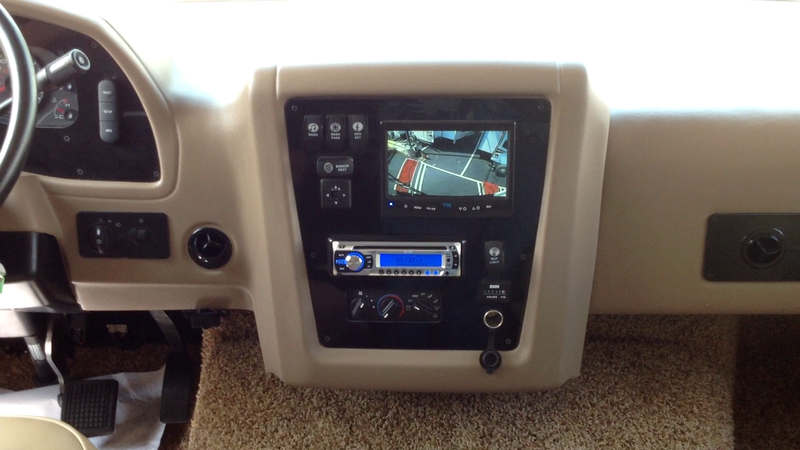 Here’s the “missing” radio/CD/DVD player. It’s wired to the salon TV, and also the surround sound system. We tested it with a DVD and a CD. Works good, but you have to read the manual! Things like turning on the sub-woofer aren’t very intuitive. Speakers aren’t great quality, but not terrible. 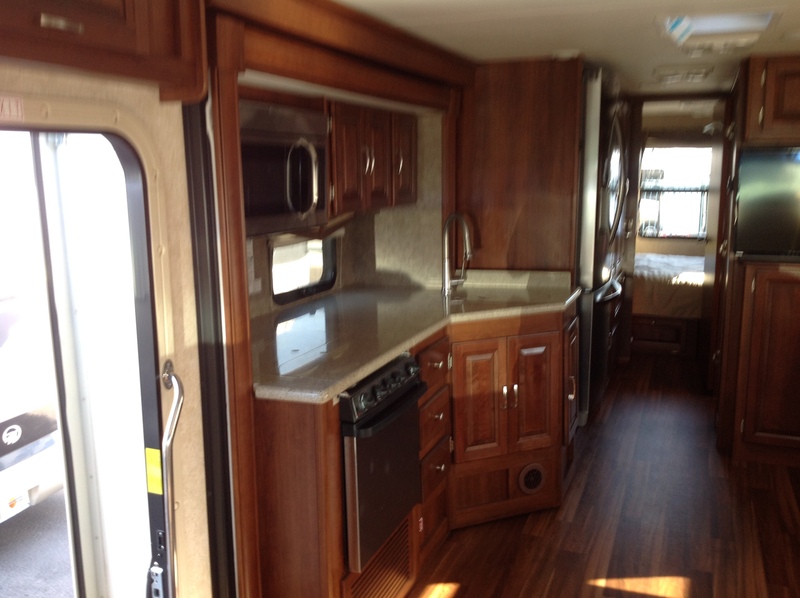 The Newmar we looked at had a lot better sound system, but that coach cost about 30K more than this one. I’ll keep the extra money! Radio/CD/DVD player. It comes with a small remote. The controls for the leveling jacks are up front too. There is a rear view camera display on the dash. It also shows the side views when you activate the turn signals. Using this will take some getting used to, and I can’t see it well when I’ve got my polarized sunglasses on. Good display quality…and it’s got a lot of options. I’ll need to read the manual on this thing. There is a front pull down bunk in this coach. I like it because it’s manual. 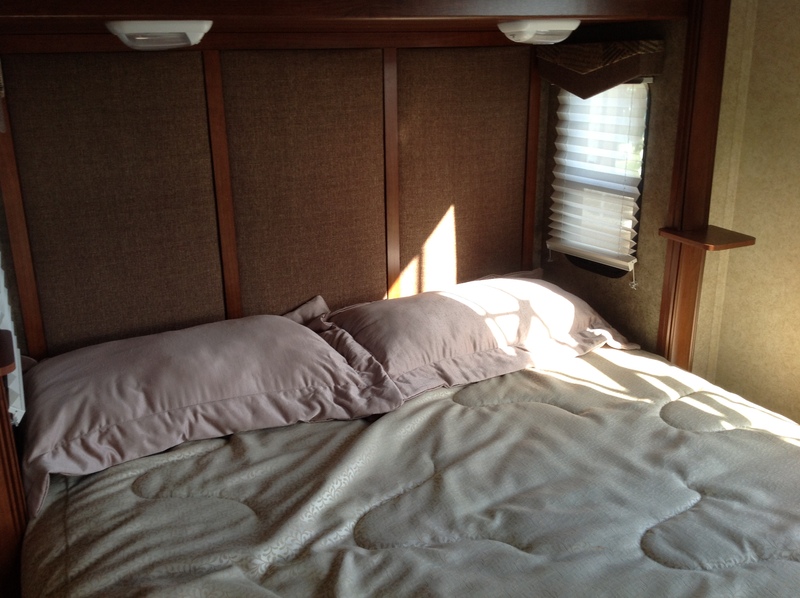 Most coaches have electric bunks up here, and they tend to fail. I doubt we will use this much until we have grandkids that are a little bigger. It’s rated for 200 pounds, so only smaller adults can be up there. A ladder came with the coach for this. It’s stored in the large compartment in the back. 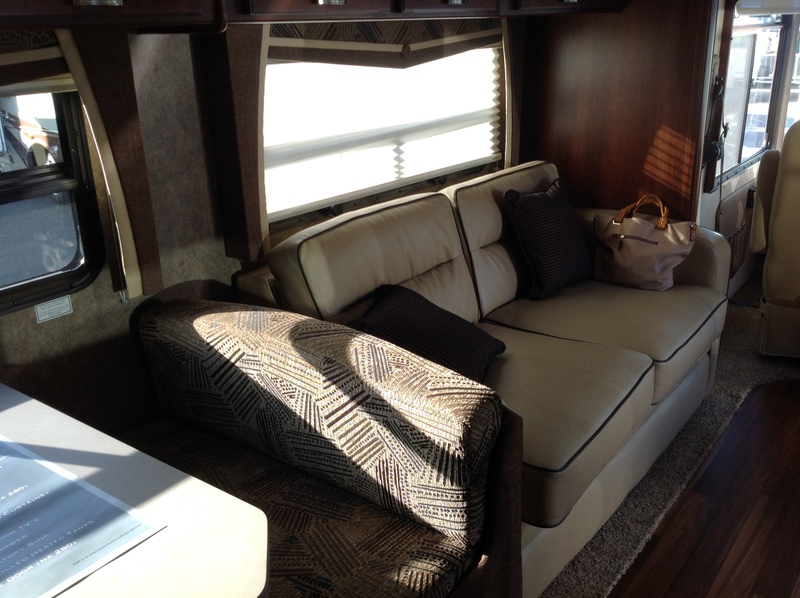 This coach doesn’t have curtains for the windshield and side windows – it has roller shades. The front one is powered, and will only come part way down when the engine ignition switch is on so it can double as a sun visor. The side shades are manual pull down, and look just like the front shade. You could pull them part way down to act as sun visors too…..they are easy to reach from the driver and passenger seats. I like this a lot better than the mini blinds that were in the rental coach. We tried out everything. I didn’t see anything wrong….all the systems worked. Air conditioners, fans, furnace, stove, microwave, fridge, Radio/DVD player, TVs. I was surprised at the picture quality on the TV off of the antenna. The HD came through really well, and looked just great. After we got all the way through the inside of the coach, he took us back out and showed us the contents of the “goody” box. There was a lot of stuff in there. A fresh water hose, a sewer hose, pressure regulator, chemicals for the toilet, a nice offset truck air gauge, a long lighter for the oven, and a nice little mechanic’s tool kit. After we looked at that, he said that we had a $25 dollar gift certificate coming, and he suggested a couple of things we should buy in the dealer’s store. He said the sewer hose in the goody box is lousy, and suggested that we get a better one in the store. He also suggested that we buy a 30 amp to 50 amp adapter, since there are a lot of parks that only have 30 amp. We thought those were both great suggestions, so we went over to the store and picked those two things up. While we were at the store, the tech talked to one of the mechanics about the broken 7 pin connector. When we were done in the store, we went back to the main office in the golf cart. Laura and I finished off the remaining paperwork and gave them cashiers checks for the down payment, and a check for the insurance. With that, we were basically done. We went back to the coach. As we arrived, the mechanic was busy putting on the new 7 pin connector, and he said that somebody was bringing over the missing microwave turntable and the correct removal tool for the water filter housing. They both showed up within a few minutes. The tech came back, and walked me through buttoning up the coach to get it ready to drive. We put in the awning, moved the slides in, retracted the jacks, unplugged the 50 amp cable, and stowed what needed to be stowed. All in all, this was a great PDI, with the only defect we found fixed before we left. I was extremely pleased with the service at the dealership. I guess I could mention their name now – it was Mike Thompson’s RV. One thing I forgot to mention – I took video of the entire PDI with my iPAD. Most of the pictures in this article are screen captures of that video. Now it was time to drive off to the campground. I punched the address into my iPHONE. I also had a printout of a Google Maps page that the finance person gave me, but I’ve gotten to where I don’t like trying to read those printouts while driving, especially when I’m driving something new. So I used the iPHONE GPS, and put the phone in my shirt pocket so I could hear Siri talking to me. Laura and the dog were taken back to the car in a golf cart (Stephanie took care of this)….I was going to meet Laura out on the street in front of the dealership. So now it’s the moment of truth. I closed the door of the coach, making sure that I could hear the steps retract. Then I sat in the driver’s seat and fired up the engine. I didn’t have to back up, so the drive out to the street wasn’t too bad. There was a travel trailer parked in the roadway. There was enough room to squeeze by, but it felt a little tight. I made it out just fine, and made a right turn on the road. Laura was out there waiting. The drive to the park was easy….get onto the 215 freeway, and go about one mile up the road (I think it was about two offramps down the road). The coach handled great, and felt like it had more pep than the Fleetwood Flair that we rented back in November. It seemed to handle very well….I was in-between trucks a couple of times, and felt plenty stable as their air pushed on the coach. I’ll cover the arrival and set up at the campground in another post. 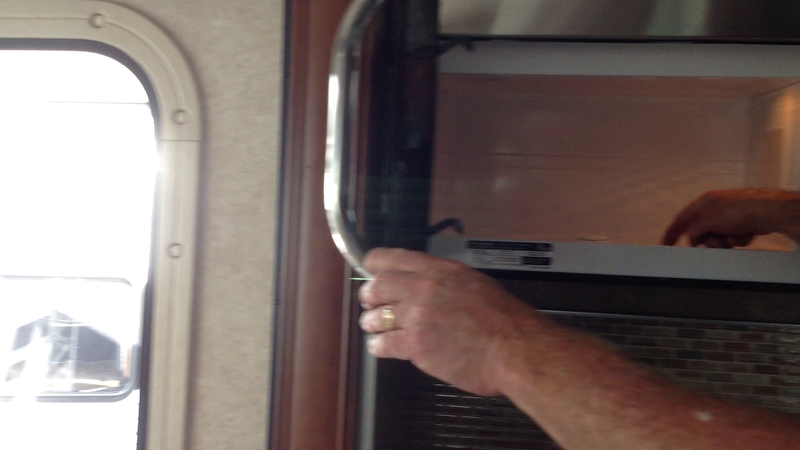 Bottom line, I’m very pleased with the quality of the coach (so far) and the service at Mike Thompson’s RV. I think I’ll go over to Yelp and put some good words out there. This story really starts at our Credit Union. Since we were foiled in our attempts to get a good idea of what we could afford at the dealer in Moorpark, we decided to go check out our Credit Union. I had gone on their website, and they had loans specifically for RVs advertised there at very good interest rates. Laura and I went over there and had a chat with a loan officer. 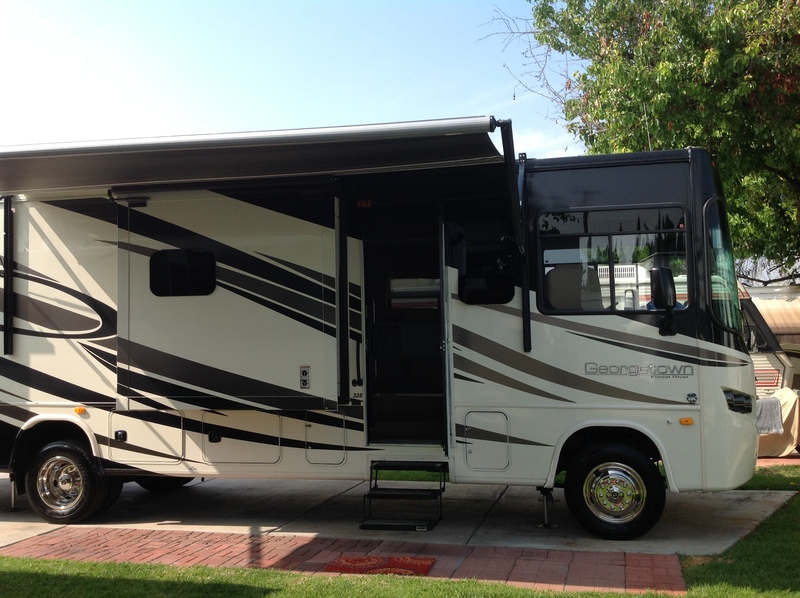 We discussed what we wanted, and filled out a loan application to get pre-approved for an RV loan. The entire process took about a half hour. The loan officer said he would call the next day with results. We ended up getting a call later the same day. We were approved for a loan, but at a lower dollar amount and a higher interest rate than we liked. We also had other limitations. No coaches over 10 years old. No coaches over 30K miles. Can’t buy out of state. Maximum term was 10 years, instead of the 15 to 20 year maximums that are widely available, at least for new coaches. As I was talking to the loan officer on the phone, I was just shaking my head. I’ve been with this Credit Union since 1978. They used to be tied to my employer. Now they have expanded to service anybody who wants to belong due to the new Credit Union regulations, and they changed their name too. But they haven’t really changed how they operate. For loans, they are very restrictive and very strict. In all the years that I’ve been with these folks, I’ve never been able to get a decent car loan from them, and in the early days, I couldn’t even get loans from them for things like appliances. The last few car loans I’ve gotten have been from the GM loan company (GMAC)….I always tend to buy GM cars since I still get the GM Employee Discount. I always got a much better deal from GMAC than the Credit Union would offer. Better terms, better interest rates. I was hoping that since I’m a lot older and have a lot of resources at this point, I’d get better treatment from this credit union. Nope. Probably won’t bother with them again. We still use them for savings accounts, of course, but I’m not sure why. After that fun experience, Laura and I started looking in two directions. First, we would see what we could get for the amount of money that the Credit Union would allow us. 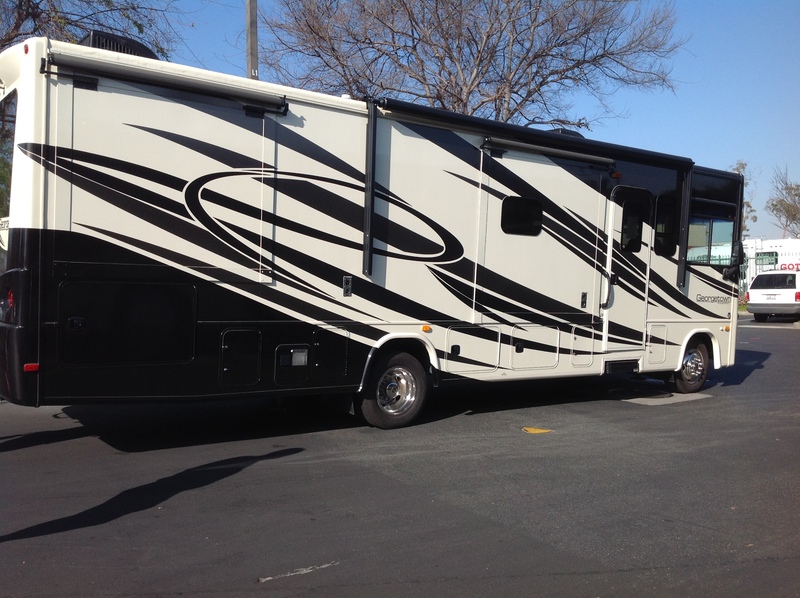 Second, we would go to one of the big RV dealers in the area and talk money with them on new and slightly used coaches. If we were to try to stick to the Credit Union limits, we would have to walk a tightrope for a Class A Coach. We would have just over 70K to spend, including the required down payment of 15K. There are lots of fairly well made coaches out there from the 2006-2009 time-frame available for that price or less. It knocks out almost any diesel coaches, but at this point we aren’t interested in those anyway. The term of the loan was probably the biggest problem. If we go with the longest term offered, we get an interest rate that I just flat-out don’t want to pay. If we go with the shorter term that has a better rate, we are going to be looking at coaches from the earlier years – 2006-2008 or the monthly payment is going to be too high. Going with a coach that old is risky, in my opinion. Coaches from that vintage that have been used and maintained correctly will be pushing on the 30K mile limit. Coaches that age that have very low miles (I’ve seen as low as 3000 miles) have been sitting. And sitting. And sitting. Motor Homes that are parked in a storage lot and forgotten for years at a time develop some really bad problems. Dried seals. 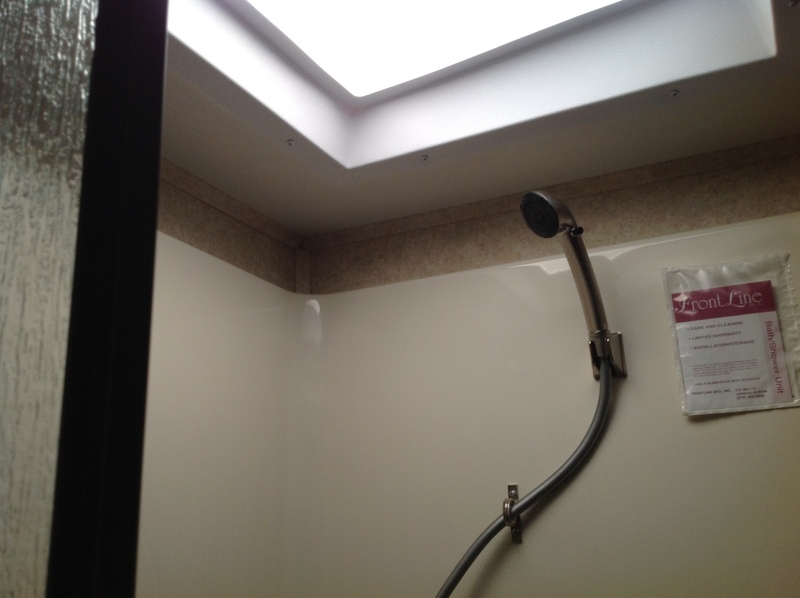 Roof or window leaks that weren’t found and fixed right away, which can lead to mold and dry rot. Tires in need of replacement because of sun damage. Paint problems. Gummy engines. Gas and oil that have absorbed a lot of water. Some of these are multi-thousand dollar problems. I’m also a little worried about 2008-2009 coaches, because they are from the time when the RV industry was experiencing one of the largest downturns ever. Many old guard companies went out of business during that time. Some of them got swallowed up by Forest River and Thor, but there was a lot of worker displacement and probably a lot of bad morale. Fleetwood is a good example. They are still in business today with new partners, but they went bankrupt during the downturn, and moved their manufacturing out of California overnight. Finally, if we wanted to buy a rental unit from an outfit like El Monte RV, the 30K mile limit would make that impossible. Why would we even consider buying a rental? If you want to go very cheap, a former rental unit can be a good choice. I’ve done a lot of research on this. 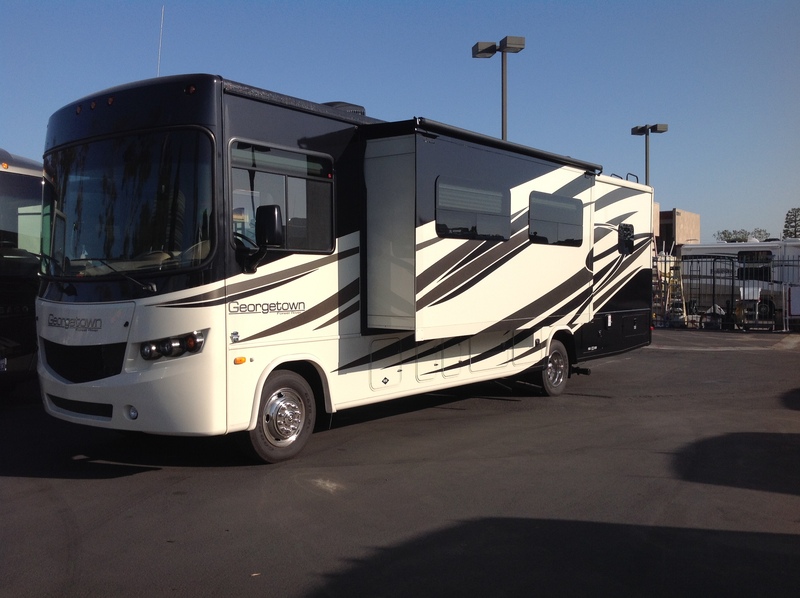 El Monte RV tends to sell their coaches after 4-6 years. The rapid turnover is important to their business. They rent mainly to foreign customers. Most of these folks are German, but there is a mixture of Europeans that come over here and rent RVs. 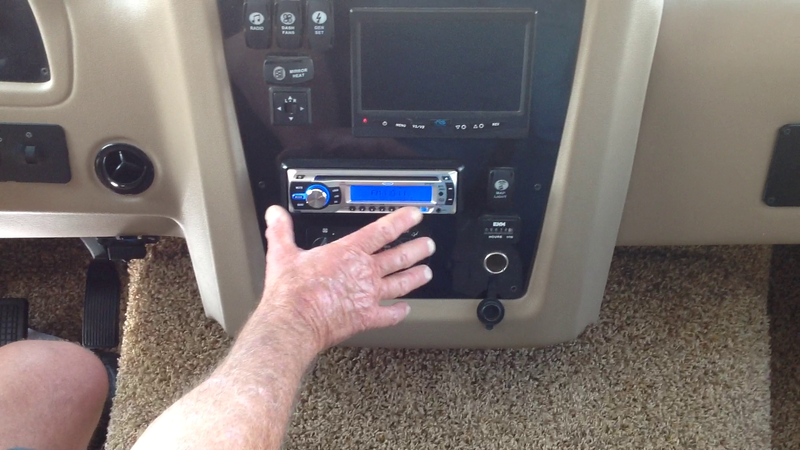 These customers want a clean, modern coach with the latest electronics. That means that 4-6 years is the useful life. 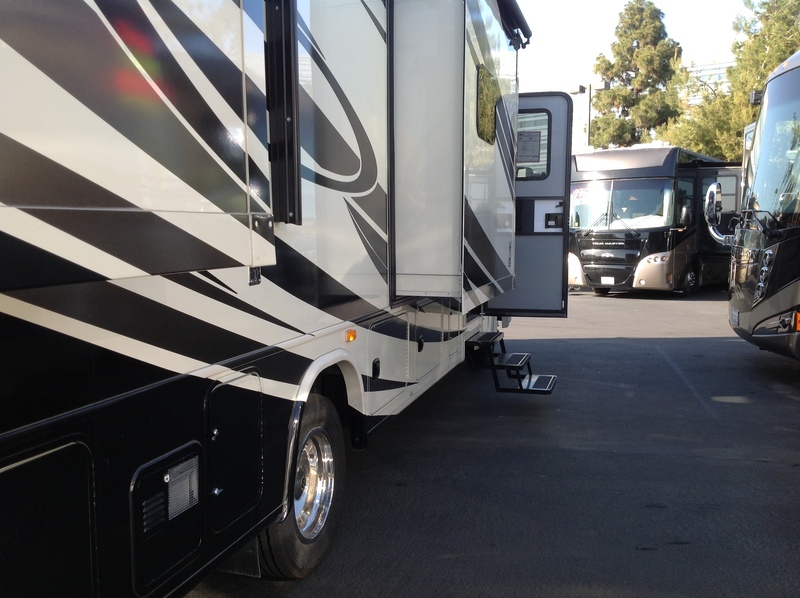 It’s also important that these coaches be reliable – El Monte RV doesn’t want customers getting stranded. That’s bad for business. So these coaches have been maintained by the book. Laura and I have looked at some of their coaches from the 2010 model year. They had 50-60K miles on them. 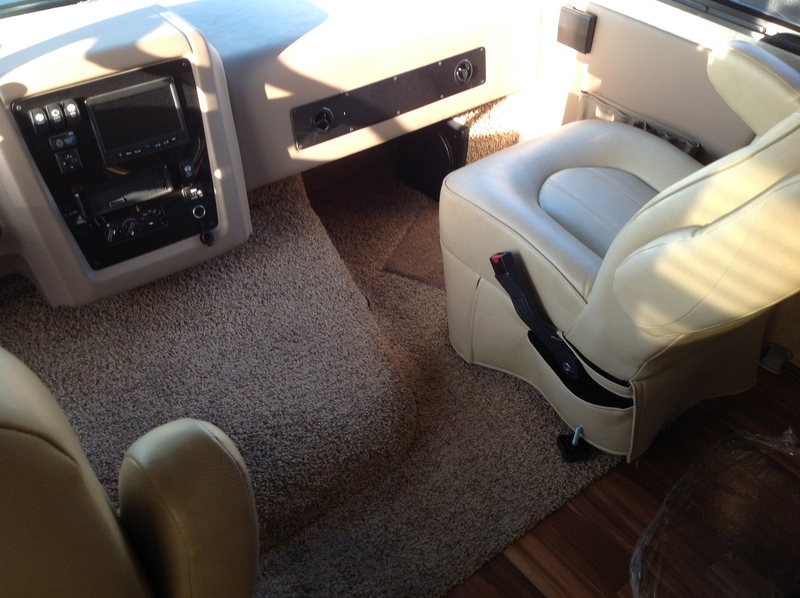 Problem areas were fixed for the sale – you often get a new mattress and new upholstery inside. If the tires are too old, they are replaced. All the systems have been tested and repaired. El Monte also supplies the complete maintenance records for their coaches, so you can see everything that was fixed on them, when the oil changes happened, and so on. I would be more wary of buying a 2008 non-rental coach with 5K miles on it than one of these rentals of the same vintage, because I know the extreme low mileage coach is going to have problems due to sitting, and I’m not going to have a reliable look at the history of the unit. Bottom line is that, if I chose to go with the Credit Union loan at the shortest term, former rentals are probably the best choice, but the 30K mile cap ruins that idea. It’s funny when you think about it, because the lack of knowledge on the part of the Credit Union is going to cost them in some cases. Ignorance is bliss, as they say. Orange County RV Show Again! As we were making plans to go shopping again, I got an email from the largest RV Dealership in So Cal. It was the same one that held the Orange County RV show that we went to a couple of months ago. They were holding the Orange County RV Show again at the same location, and it was starting the next day. This was perfect….our plan was to go check out what they had in the way of used coaches in the Credit Union price range, plus take another look at the Georgetown 329 and talk some dollars. We didn’t need to worry about having somebody there to have that kind of discussion. It’s harder to leave this dealership without having these kind of discussions! There was another Georgetown coach that I wanted to see as well. I’d seen it on the Forest River website and on some dealer websites. It looked very good, even better than the 329. This coach is the Georgetown 328. We got to the show on Friday afternoon, after a nice lunch with Laura’s mother and aunt. We just got into the gate when we were approached by a salesman. He seemed to be a nice guy, so I explained what we wanted to do. This guy was very open to our ideas. We walked down the row of new coaches, toward the Georgetown 329. On the way, he pointed out an Itasca coach, so we went in to take a look. 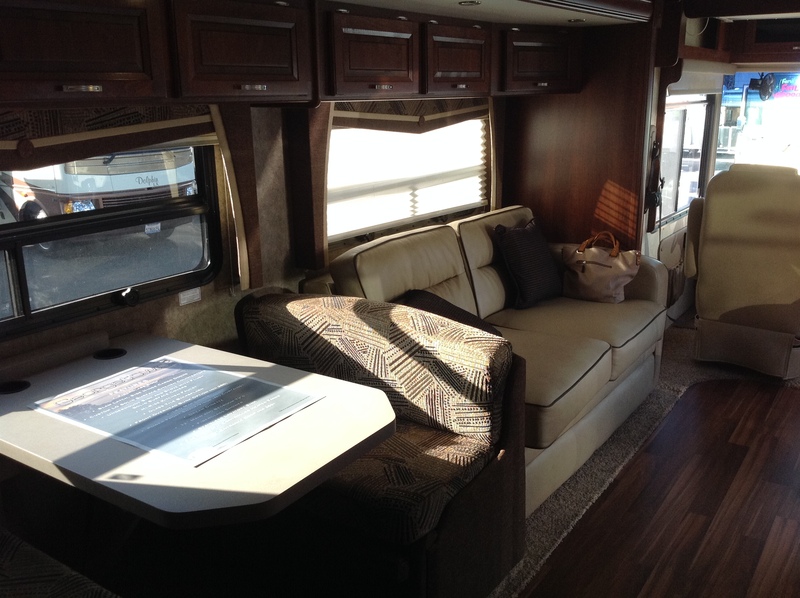 This is a Winnebago product, and it looked very nice. It was a 31 foot unit – The Sunstar 31KE. There was one “must have” that this coach didn’t offer. 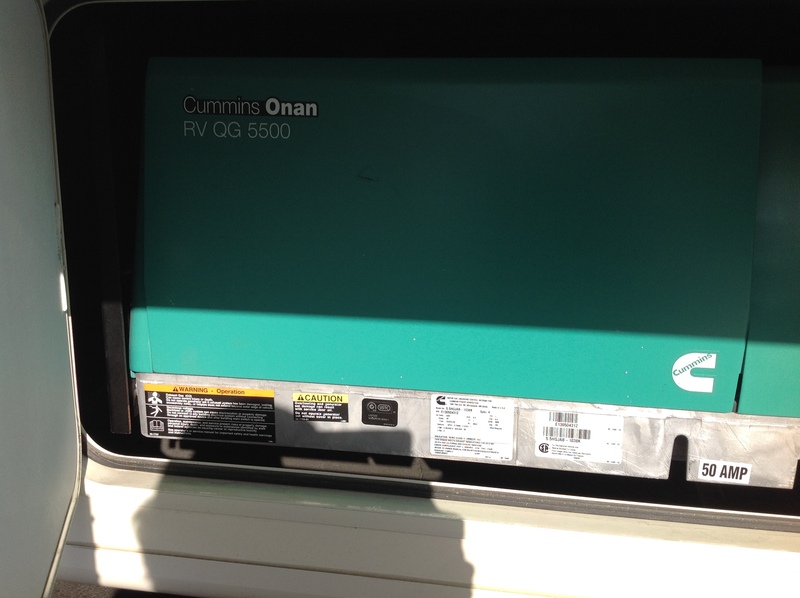 Dual air conditioners and a 50 amp electrical service with 5500 generator. That wasn’t going to work for us. This one is also on a very small chassis – only 16,000 pound, which puts it in the same league as the entry-level units that we had decided not to consider. So it was thanks, but no thanks on this unit. The salesman also pointed out a Windsport 32A, and asked if we would like to see that. This is a floor plan that Laura and I liked quite a bit, so we took a look. This coach didn’t have any show stoppers for us. 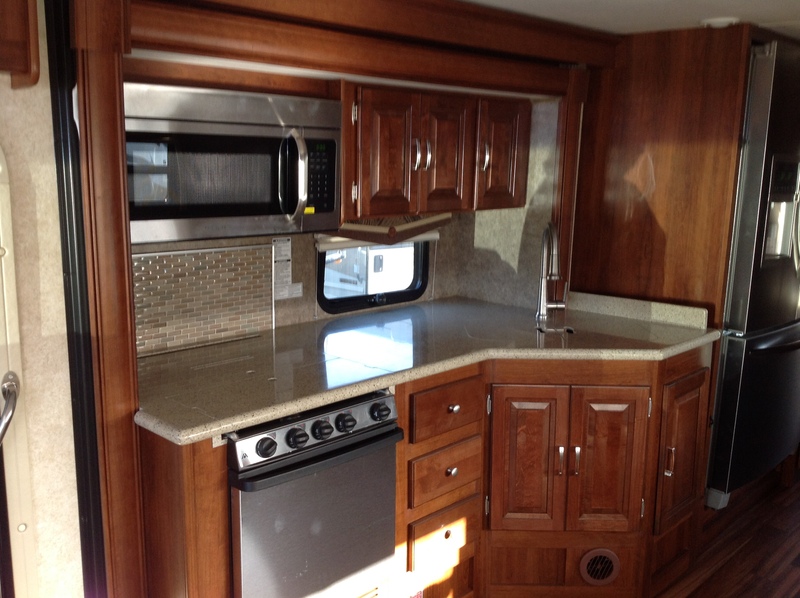 It has a nice sized kitchen counter with plenty of work space, and a wrap around dinette. As I’ve gotten more experienced at looking, though, the Thor products like the Windsport and Hurricane look pretty shoddy. 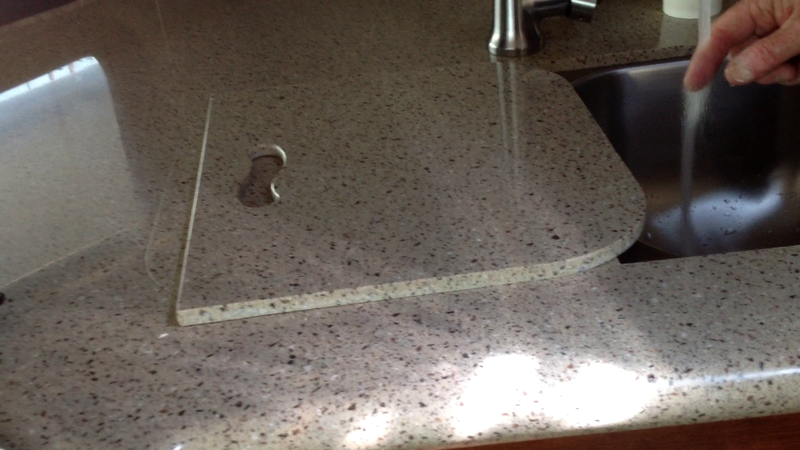 This unit has a large kitchen counter, but it’s solid surface counter doesn’t look very good. There was a strip of wallpaper about a foot wide that was used as a back splash, and it wasn’t even installed very well. It wasn’t completely straight, and it wasn’t pushed into the corner of the wall. Look how it wraps over to the wood, and isn’t even cut straight. 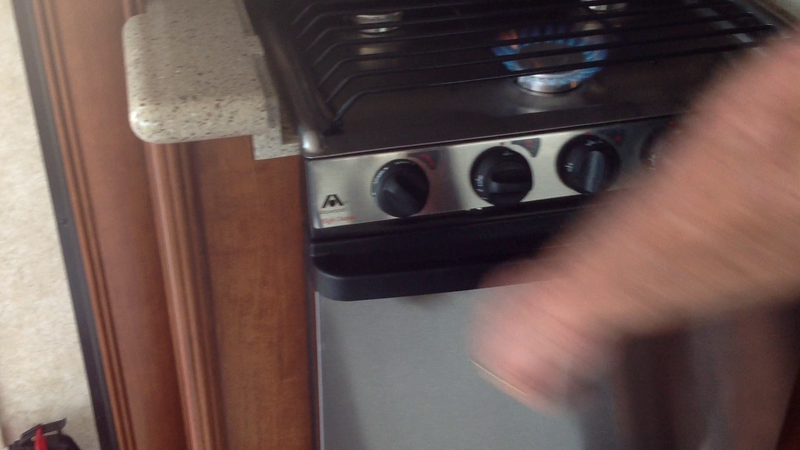 The stove has the cheap black metal cover over the burners like low-end RVs do. The LED TV was small, and not a desirable brand. The floor looked cheap. The vent in the roof over the kitchen area didn’t have a fan in it. 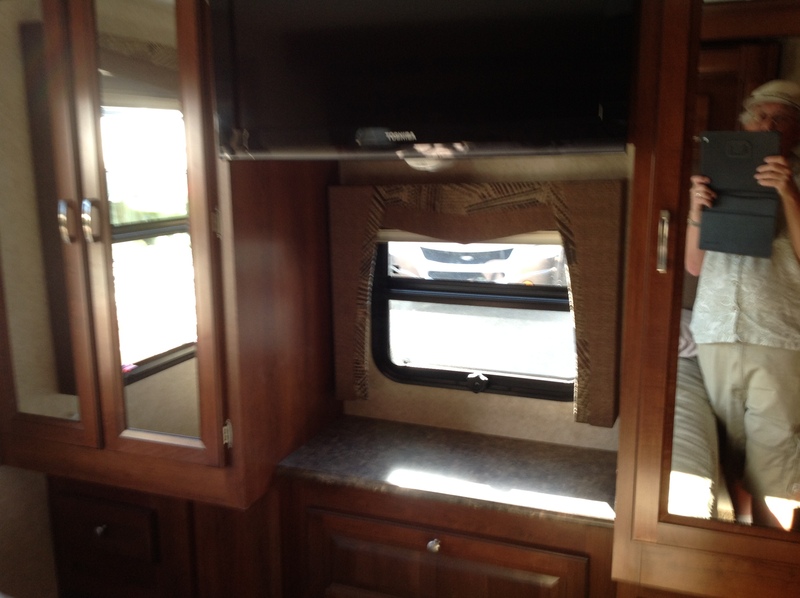 There is a wrap around dinette in the Windsport. It’s nice, but a little small. 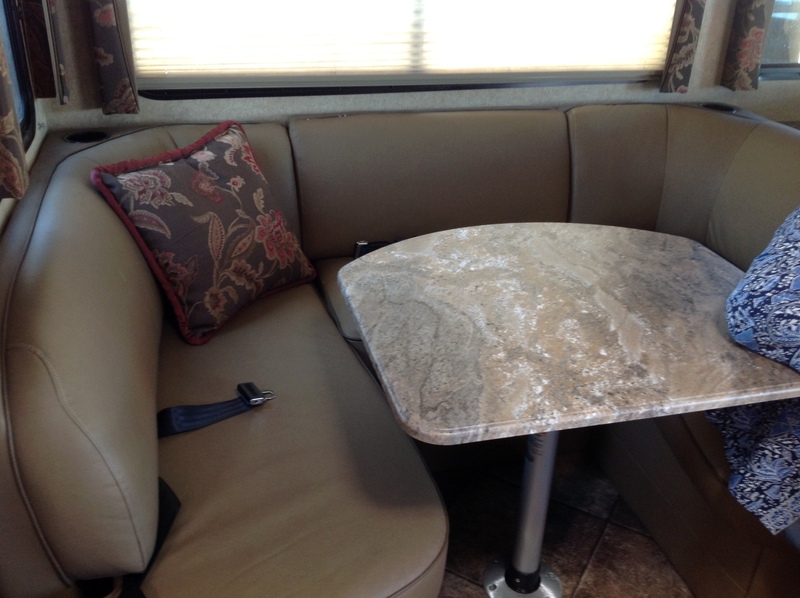 Windsport wrap around dinette. Note size of table. The bathroom had a china bowl toilet, which is nice, but you can just see the white plastic sink on the edge of the picture. Laura and I initially thought these models looked pretty good, after checking out coaches on the lowest end of the price scale like the THOR A.C.E. line, the FR3, and the Coachmen Mirada. After looking at mid-range coaches, I don’t think I could live with the Windsport or Hurricane. It’s entry-level quality at a midrange price. 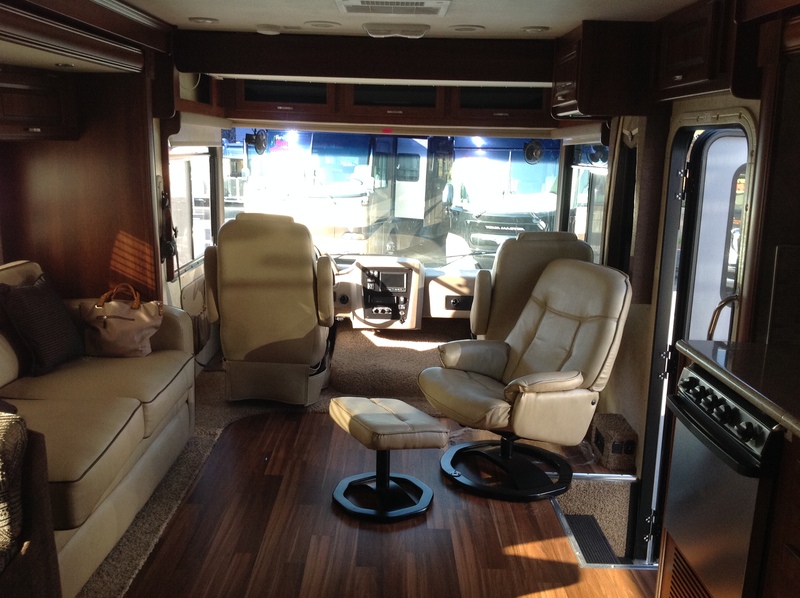 MSRP on this coach is the same as the Georgetown 329….119K. Next stop was the Georgetown section, and we took another look at the Georgetown 329. This is the one that we liked at the last show. What a world of difference from the Windsport for a unit of the same price level. Take a look at the picture below. Note the solid surface counter, a real glass tile back splash around the stove area, and the nice looking plumbing fixtures for the sink. You can’t see it in this shot, but the sink is a double basin stainless steel unit. 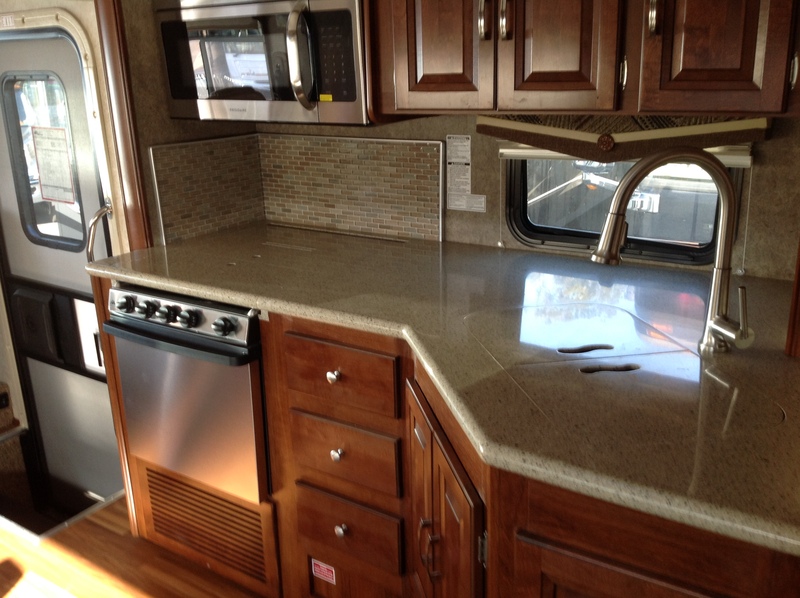 There is also a nice cover over the stove burners that blends in with the counter top, instead of the cheap black metal of the Windsport. 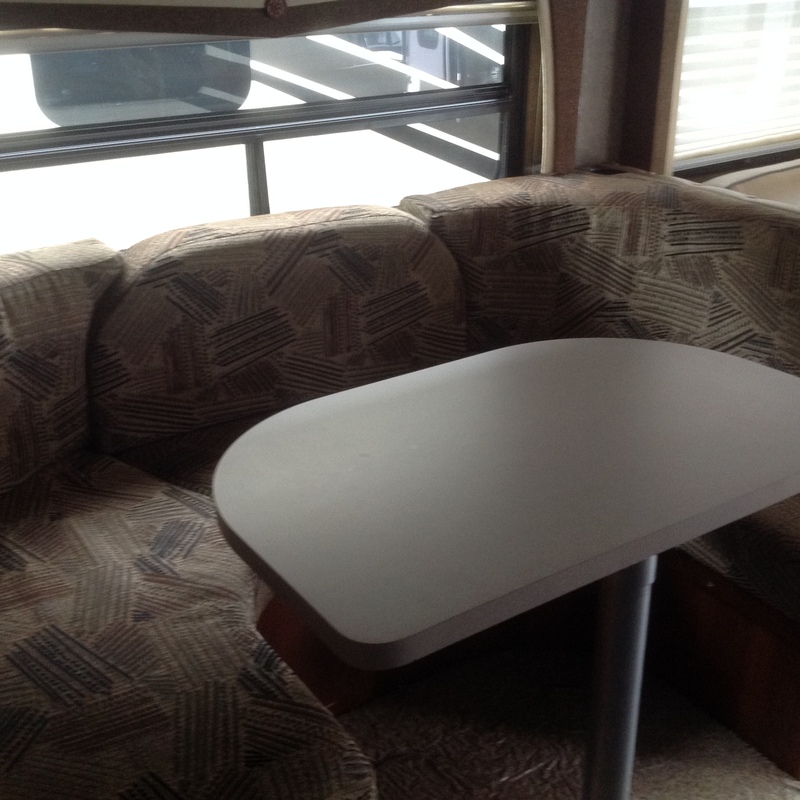 You also get the wrap around dinette with this unit, and it’s quite a bit nicer than the one in the Windsport. The it’s about twice as big, for both the seating area and especially the table space. I asked the salesman if there were any Georgetown 328 units available. He told us that there wasn’t one of those at the show, but there was one at the Colton location. 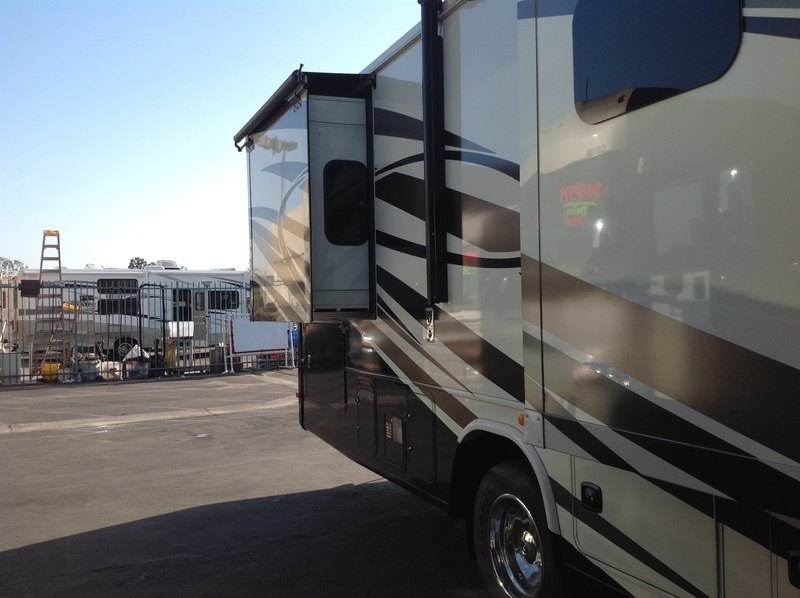 This is our salesman’s home base….he was at the Fountain Valley location to help with the show. He offered to bring the 328 to this location for us to look at, if we were interested. He said he had to go over there the next day and pick some stuff up to bring to the show anyway. I asked him if the price for the 328 was close to the price of the 329, and he said that they were fairly close. The MSRP is on the 328 in Colton slightly higher than the 329 on this lot, but that is partly due to options. Laura and I told the salesman that we could come back to the show on the next day, as long as it was after about 3:00. He said that was perfect for him, and that he thought he could get the coach to Fountain Valley by about 4:00. There were two used coaches on the dealer’s website that looked interesting to me, and weren’t too old. We walked over to the used coach row, but neither of these coaches were there. The salesman didn’t know if they were sold or what, but he said sometimes the website is a little behind on updates. There was only one coach there that was not too old. It was a Windsport 31D. We looked at it, but knew we weren’t going to be interested. This is a model I’ve mentioned before, that has a folded kitchen counter. 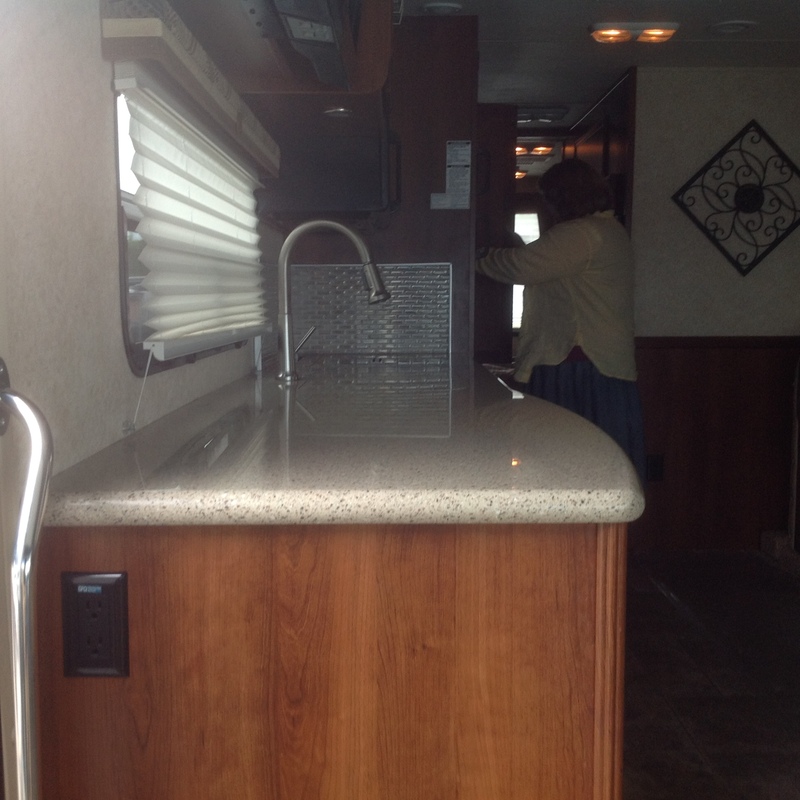 This one was a real bare bones unit…plastic sink and other cheap stuff. Here’s a picture that I took at the last show. Might be the same unit. We suggested that we take a look to see if we could financially quality for either of the new Georgetown coaches before we went any further. The salesman agreed, so we went into the office to get that process started. Low and behold, we were fine from a loan standpoint for either the Georgetown 329 or 328. So it was off to Redondo Beach for the evening, with plans to come back the next afternoon, which was Saturday. In the evening, I scoured all of the RV Forums looking for any bad things about the 329 or the 328. I had seen almost everything on both of these coaches already, but wanted to check one more time. From what I could tell, people were happy with these models. Of course, neither model is perfect, but over all there were few complaints about either of these models, or Georgetown in general. We got a little bit of a late start on Saturday afternoon, and the salesman got stuck in traffic on the way over from Colton. By the time we finally connected, it was about 4:30. Georgetown in the Fountain Valley parking lot, just after arrival from Colton. The salesman had just pulled into the parking lot at the Fountain Valley lot, and was unhooking his small pickup truck, which he had towed. The coach looked very nice. It appeared to be about the same size as the 329. Looking at the specs, it’s 1 inch longer at 34’4″. Wheelbase, size of tanks, height, and width are the same. The 328 has one more slide than the 329, on the passenger side of the coach. This will probably make the 328 a little bit heavier than the 329. We entered the coach and took a look. Since the slides were all in, we got a good look at what the coach looks like inside while in driving mode. There is enough space to walk from the front to the back easily. This isn’t the greatest picture, but you can see how close the widest part of the kitchen counter is to the wall on the other side of the coach. Georgetown 328 with slides in. The salesman asked if we wanted to take the coach out for a spin. We said yes, and he drove back out of the parking lot. We went around Fountain Valley in a big circle. This coach felt very much like the Fleetwood Flair that we had rented, and that’s not surprising. It’s got the same engine, and is about the same size and length. I was surprised at how quiet this coach was – really not much rattling around in there, although it was not loaded with gear yet, and that probably helps. When we got back to the lot, I asked if we could see how the coach looked with all the slides out, so he drove into the main part of the lot and parked it in a spacious spot. 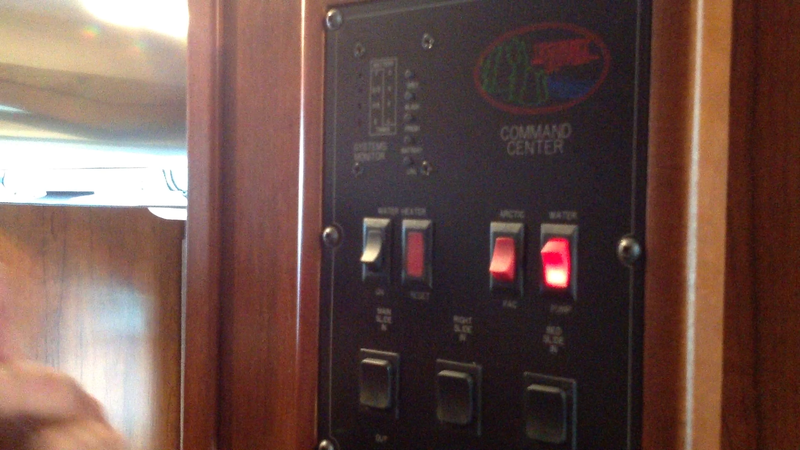 Then he went to the control panel, which is in the hallway between the front of the coach and the bedroom, and pushed the buttons to open each slide. After that he fired up the generator and got the main air conditioner going. Cold air came rushing out quickly. Having both of these salon slides out gives a lot of floor space….this coach seemed much bigger that the 329 as a result. 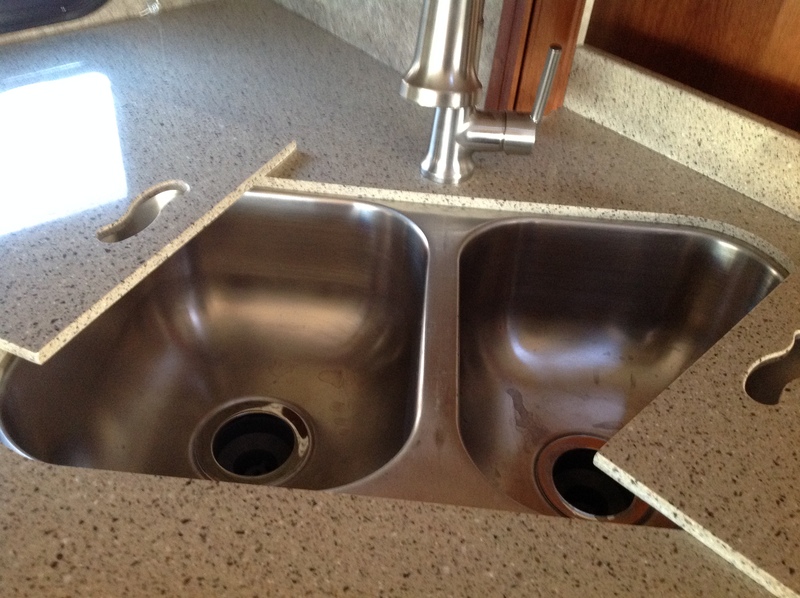 In the picture above you can see that the counter top needs to come out further than the more galley-like straight counter on the 329 below. This is because of the refrigerator in the 328. 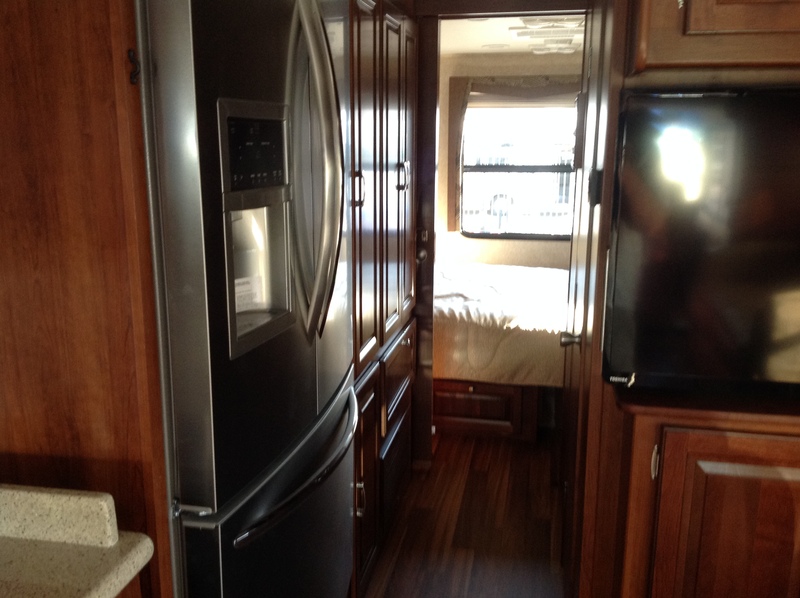 It’s a full size residential refrigerator instead of the Propane/Electric convertible unit that is used in most RVs. Here’s a better look at the residential fridge in the 328. And here’s what a Propane/Electric fridge looks like. Much smaller, and a lot less deep. This one isn’t from the Georgetown 329….it’s from the Windsport 32A, but they are basically the same type. I didn’t get a good shot of the 329 fridge. I was actually a little bit concerned about the residential fridge in the 328 at first, but I was also concerned about issues with the typical RV refrigerator. There are pros and cons to each. With a Propane/Electric fridge or “Absorption” fridge, when you have electrical power, the fridge runs on electricity. When no electricity is present, the fridge switches over to propane automatically. The advantages are pretty obvious. If you are doing boondock camping (camping in a location without electrical hookups), the ability of the fridge to run on propane is a nice feature. There are some downsides, though. 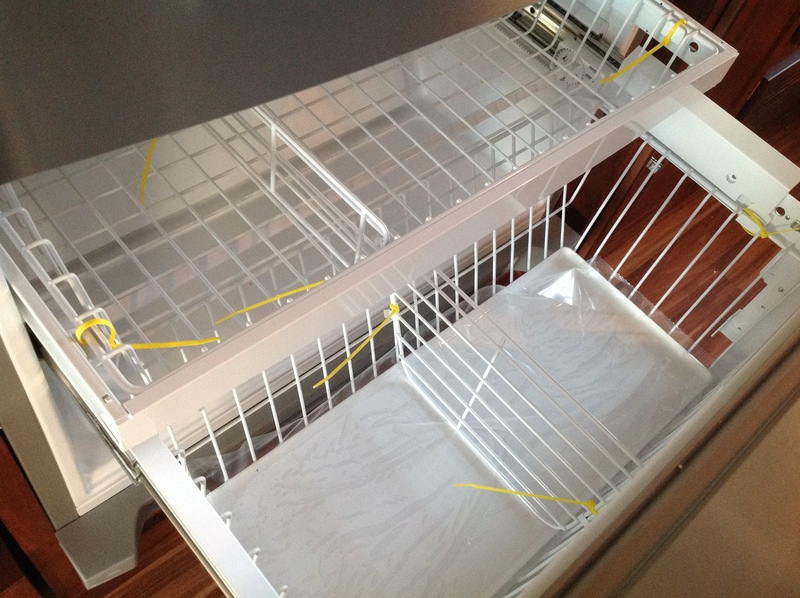 There are two makers of this kind of fridge – Dometic and Norcold. Both of their products have had problems with fires. There are a lot of opinions on the reason for this that I won’t go into that here, but it is a real problem, and it’s related to how the technology works. 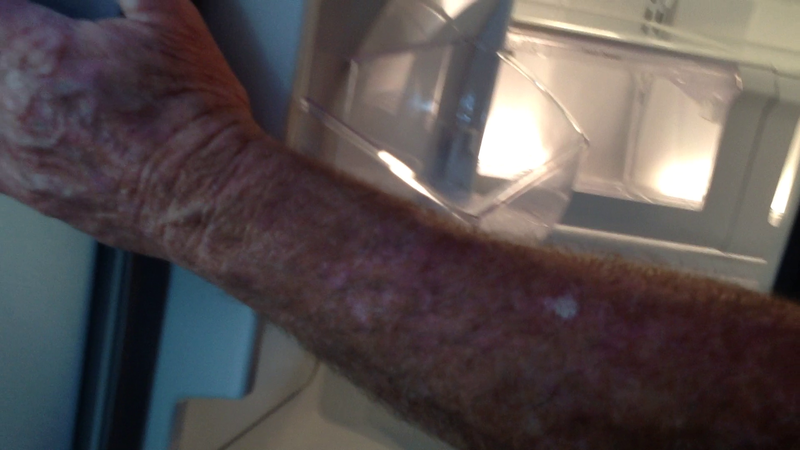 To make matters worse, fixing this type of refrigerator is very expensive. This type of unit is also quite expensive to replace. A decent model goes for over 7K. That’s more than double what a residential fridge will set you back. 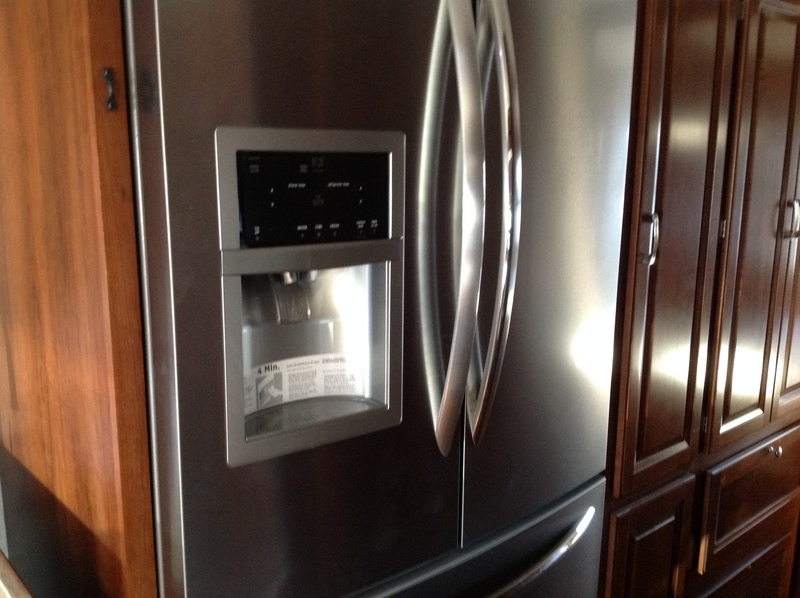 And finally, since these type of refrigerators work using evaporation, they are very slow to cool down. They also aren’t very good at keeping a consistent temperature, and can get too warm fairly easily. You don’t want to be standing in front of them with the door open, taking a long time to find what you want. I’ve heard a lot of stories of soft ice cream and beer that wasn’t cold enough. Horrors! Finally, they are small. Really small. This isn’t a problem if you have two people going away for a weekend. It is a problem if you have a the same two people going away for weeks at a time. Imagine what they would be like for a family. Even the largest four door models are small compared to a residential style unit, and they are more prone to fires than the smaller two door units. Residential Refrigerators don’t have the fire problem. They have no burner, and their operation doesn’t produce flammable hydrogen gas that can escape from the system. They just have a compressor and a fan, like the units in your home. They are also much bigger, and can hold a much more consistent temperature than Absorption units. If they crap out on you, the replacement cost is under 3K, not over 7K. They also come with bells and whistles such as water and ice dispensers in the door. 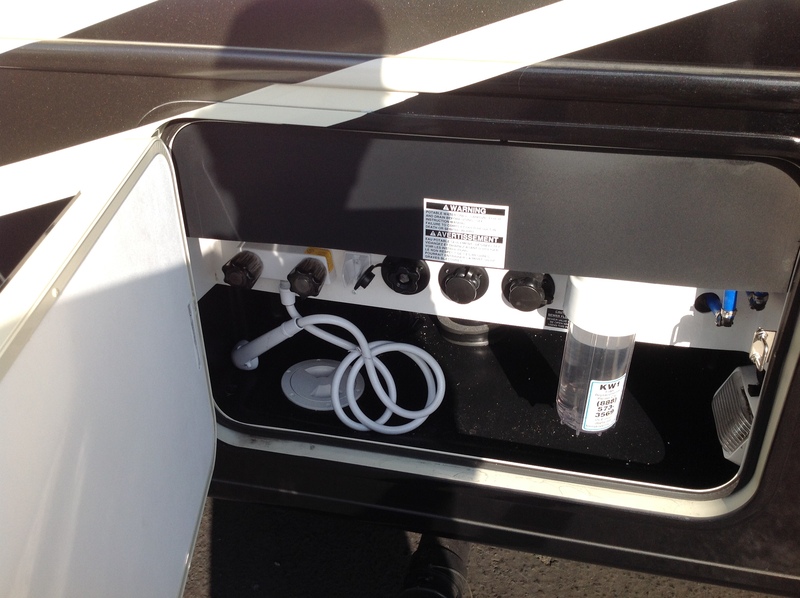 The main issue on the con side is battery consumption when you are not hooked up to shore power. I’ve seen a raging argument on the RV forums about how long your residential fridge will run on batteries when you are boondocking. If you are in a campsite with electrical hookups….no problem. The fridge will run just like your home fridge runs. When you are driving, no problem; the engine charges all the batteries as you roll, and this keeps the fridge batteries topped off. 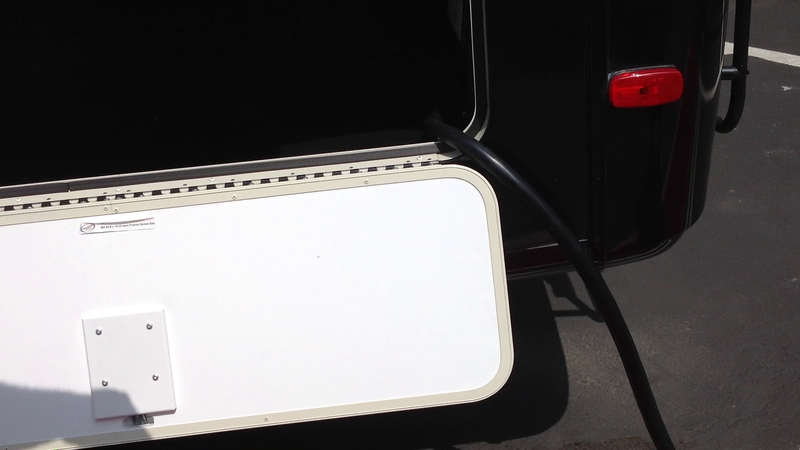 You can also run the house generator to re-charge the batteries for your fridge, so even if you are boondocking there is a way to get the batteries recharged. The problem some people see is that, in some cases, the fridge batteries won’t last an entire night – people wake up to a fridge that hasn’t been on for an hour or two. There was some discussion about this issue specifically about the Georgetown 328, with a few people saying they were only getting about 5-6 hours on the batteries, and other people saying that they were getting up to 24 hours on a charge. I suspect that the real number is somewhere between the two. We’ll see. I finally convinced myself that the battery consumption problem with the Residential Refrigerator was a minor problem, and the advantages of a residential fridge far outweigh the potential problems. Why? I don’t expect us to be doing all that much boondocking. If this was a big priority for us, we would be looking at different coaches. If you are going to do a lot of boondocking, you need to make that a priority when you are shopping. You want fresh water tanks that are at least 70 gallons. You want grey water tanks to be at least 60 gallons, and the black water tanks should be pretty close to that size as well. 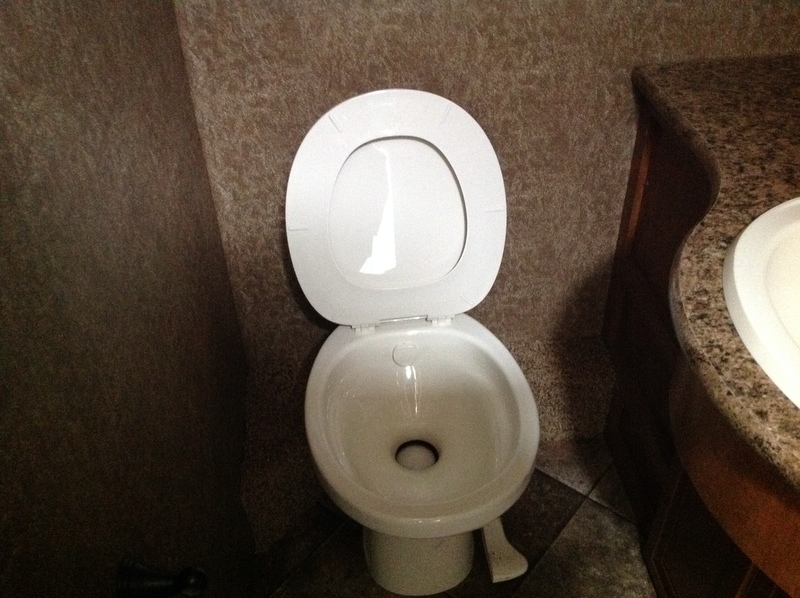 Remember that there usually aren’t dump stations at boondocking locations. They might be miles away. 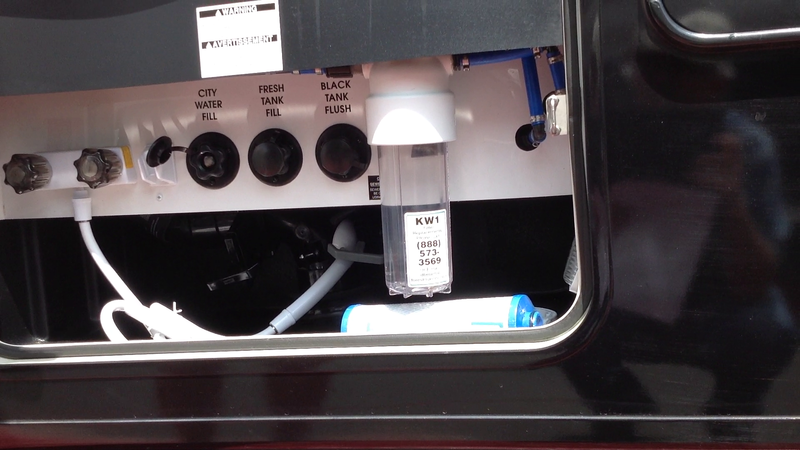 The Georgetown 329 and 328 have 50 gallon water tanks, and 41 gallons each for the Grey and Black tanks. That’s cutting things pretty slim for boondocking more than a few days here and there. One thing I would look into with a Residential Refrigerator is Solar Panels. If you get the right setup, you can keep the batteries in pretty good shape during the day, and that can really help when you boondock, even if you don’t have a residential fridge. 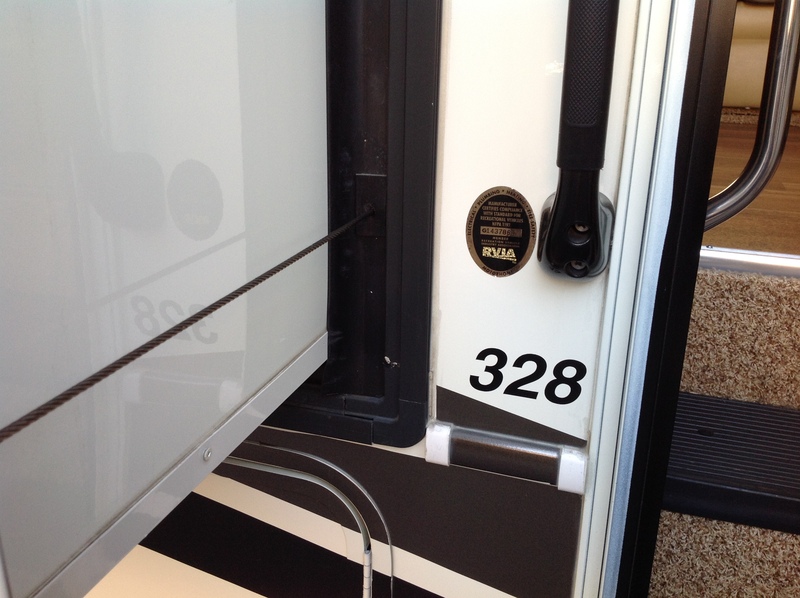 Laura and I spent some time going through the 328 in detail, opening up all of the cabinets and drawers, sitting on all of the furniture, laying in the bed, standing in the shower, sitting on the toilet, and asking a lot of questions. I went outside and looked in all of the storage compartments, the dump station compartment, and the electrical compartment. I climbed up the ladder in the back (which was quite sturdy) and checked out the fiberglass roof. Over all, we were very excited about this unit. It’s got a lot of features that aren’t on the 329, and it’s fit and finish is way beyond most other units we’ve looked at in this price range. It isn’t an entry-level coach. It’s pretty firmly in the Mid Range. 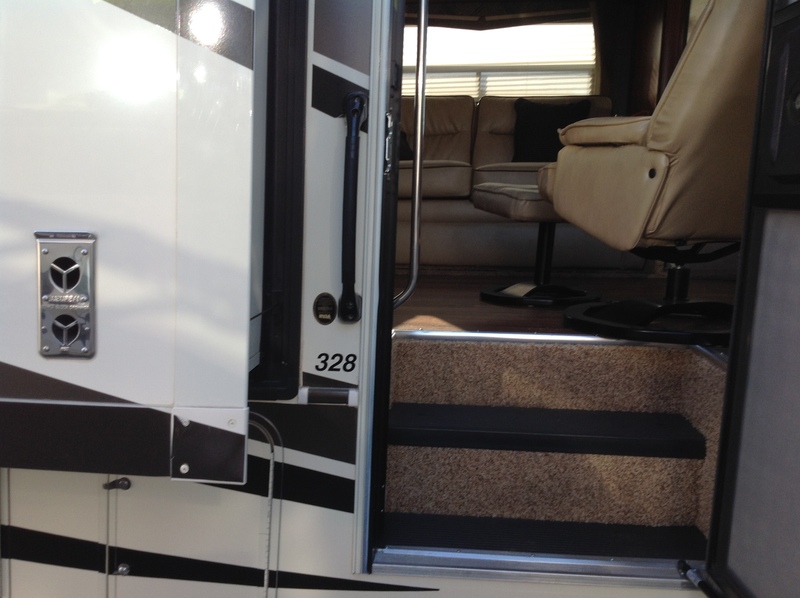 Is the Georgetown 328 as nice as a Newmar or a Tiffin? Nope, but the price difference is pretty large. 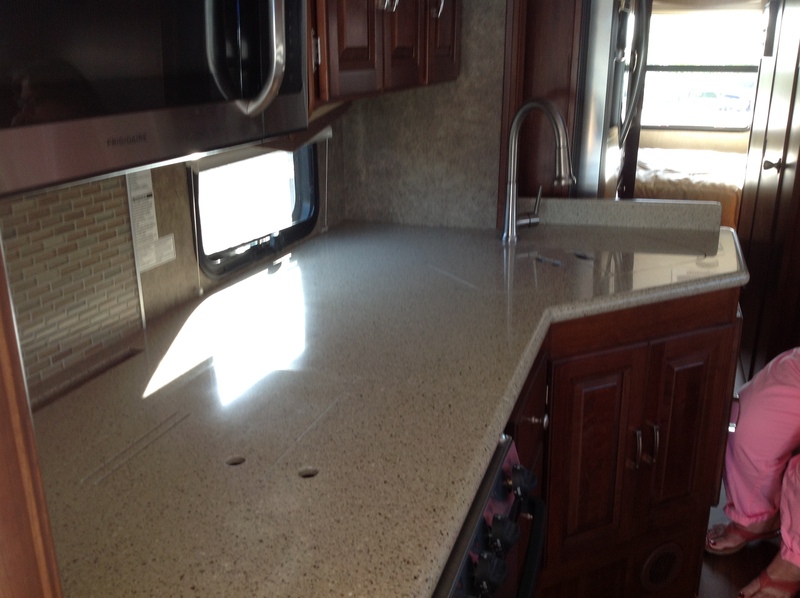 Take the Newmar 3308 that we looked at in Moorpark. It’s very comparable to the Georgetown 328 from a size and features standpoint. 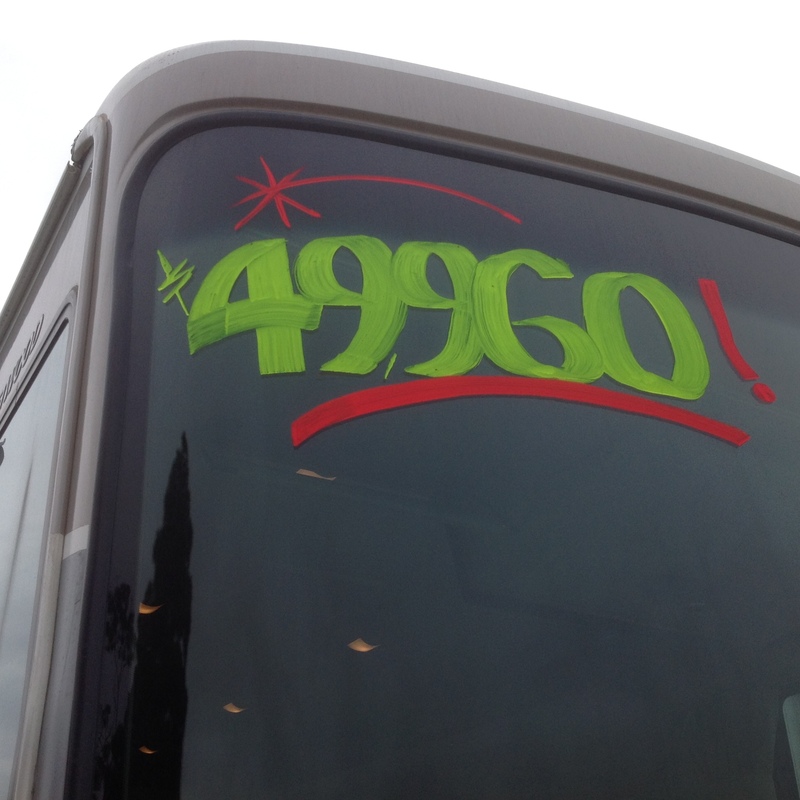 The MSRP for the Newmar 3308 coach was 147K. The MSRP for the Georgetown 328 is 126K. That’s a 21K difference. When you compare the two coaches, you find that they have a lot more in common that you think. 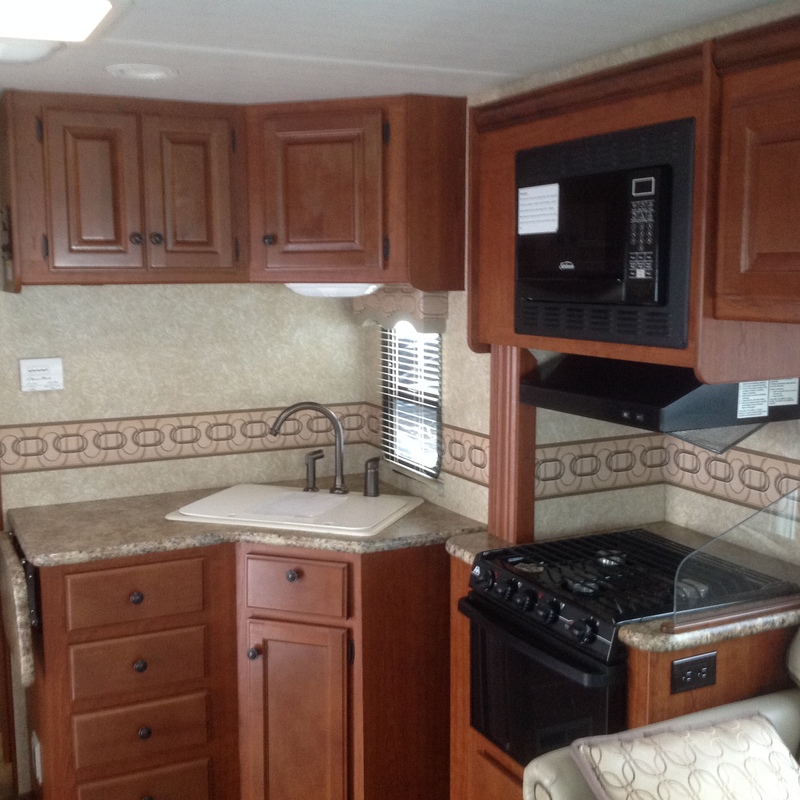 The Newmar has it over the Georgetown with woodwork and furniture. The Georgetown has a better roof, a better fridge, a larger TV, and space/plumbing for a washer dryer. The Georgetown also has an oven big enough to cook a pizza in. 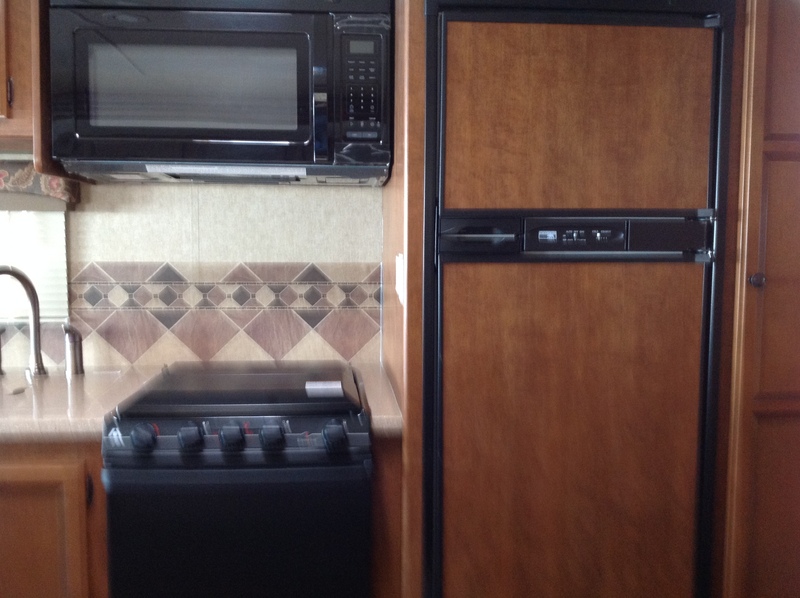 The Newmar has the same kind of cook top that the Georgetown has, and a “Convection Microwave” that is supposed to serve as an oven. I wouldn’t try to cook a pizza in that. I’m not even sure that a frozen pizza would fit in the small Absorption refrigerator in the Newmar 3308. You could fit several in the Residential refrigerator of the Georgetown 328 and have plenty of room left over. 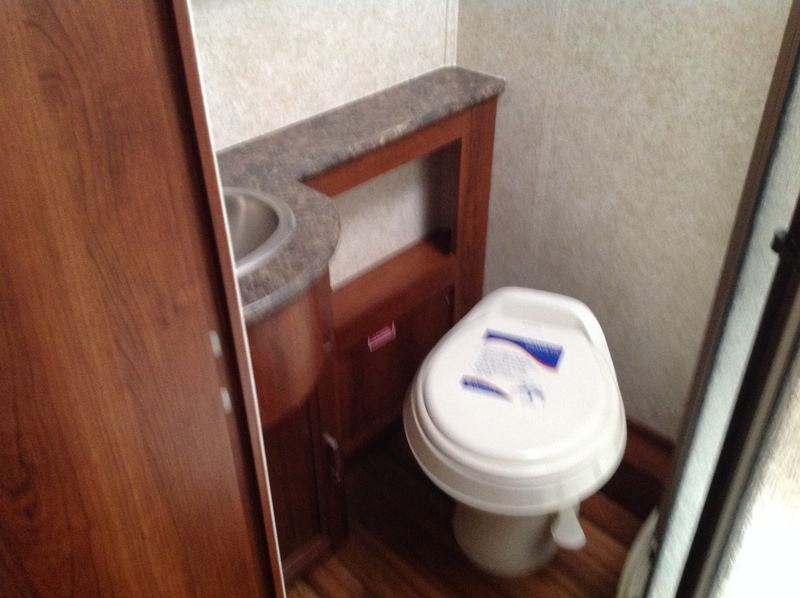 I like the storage compartments in the Georgetown better than what I saw in the Newmar. 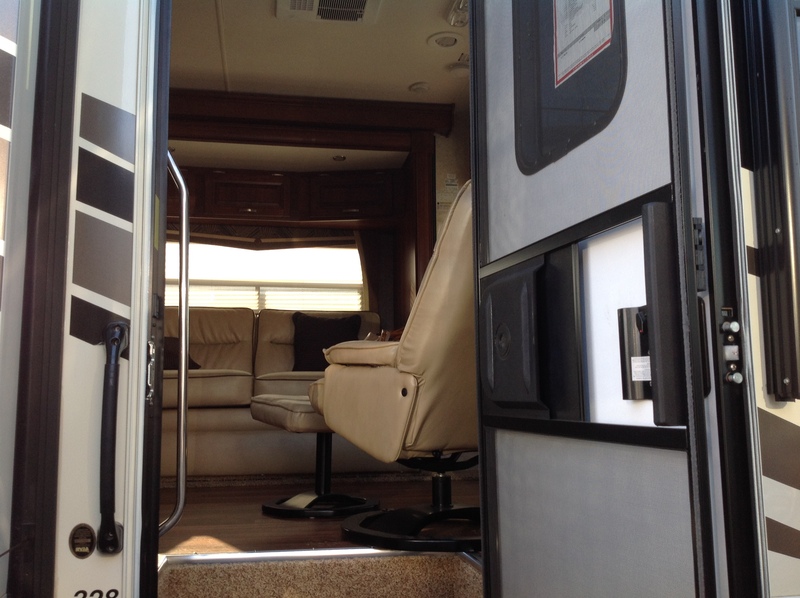 They have a roughly equivalent amount of space, but the Newmar has plywood structure in the compartments with indoor/outdoor carpet covering it. 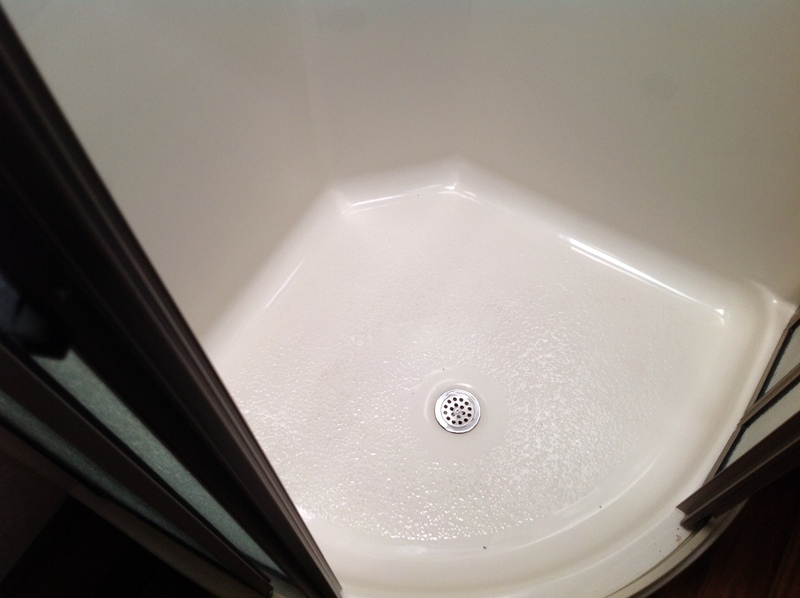 The Georgetown has rotocast plastic, with large drain holes that have screw in covers. You could hose them out and not damage the coach. If I were going to boondock most of the time, I’d probably look around for lightly used Newmar or Tiffin. Both of these coaches have larger fresh water, grey water, and black water tanks. 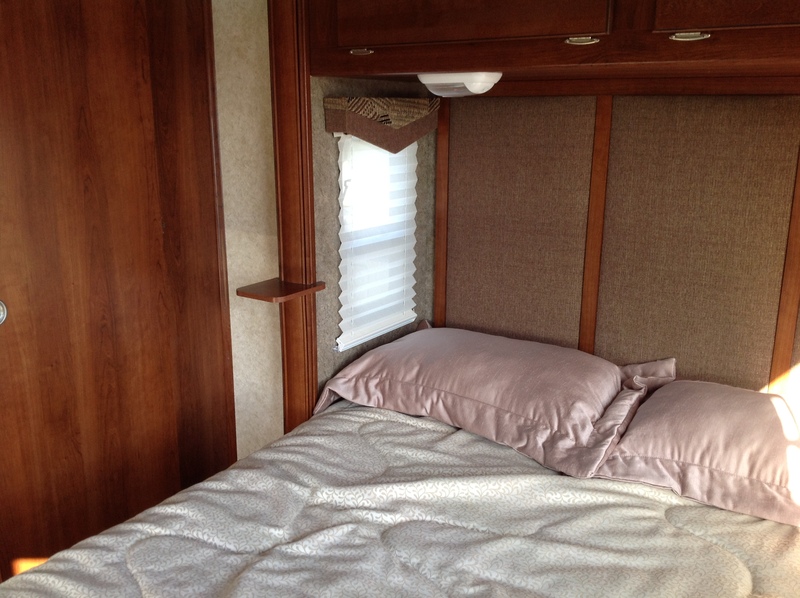 If I was going to live full-time in the RV, I would prefer a Newmar or a Tiffin, because the build quality of the furniture is probably going to hold up better. Theoretically, Newmars and Tiffins should hold their value longer than a Georgetown, but that is dicey, from what I’ve seen. I don’t see a huge difference in asking prices for Newmar and Tiffin units on the market, but the only way to find out what these coaches really go for used is to start making offers. One thing I have noticed – there aren’t nearly as many lightly used Newmar or Tiffin coaches available on the used markets – I think people tend to keep them longer, which tells me two things. First, they hold up very well over time, and second, the people who buy them are not newbies. They are more knowledgeable. I think this level of coach tends to be an upgrade for somebody who has been in the lifestyle for a while, and enjoys it. After getting finished with our inspection and all of our questions on the Georgetown 328, we were ready to make a decision. We asked the salesman if he could get us a deal on this coach, with our down payment amount, that would give us our monthly payment target. He said he was pretty sure that he could. He left us in the coach while he went to work things out. With him gone, we did more inspection, and I took a bunch of pictures, posted below. He came back saying that the numbers worked out, and showed them to us. Laura and I agreed to the numbers. The salesman shook our hands, and said he’d go get the paperwork started. We could go in and sign in a little while. He left us in the coach again, and we continued checking things out. I think we got a pretty good deal. It worked out to 24% off of MSRP, and is affordable to us. The interest rate was better than what we were offered at the Credit Union, and for a longer term. We signed all the paperwork. There’s a LOT….more than a car. We made an appointment to do our PDI (Pre-Delivery Inspection) in about a week, which gives us time to move money around for the down payment, and find a storage spot. The PDI will be done at the dealership in Colton. There is an RV Park close to Colton that the dealership has an agreement with. We can get a couple free days of camping there, so we will take them up on that and give it a good shake out. Now we are counting down the hours! Here’s what happened since the last post. 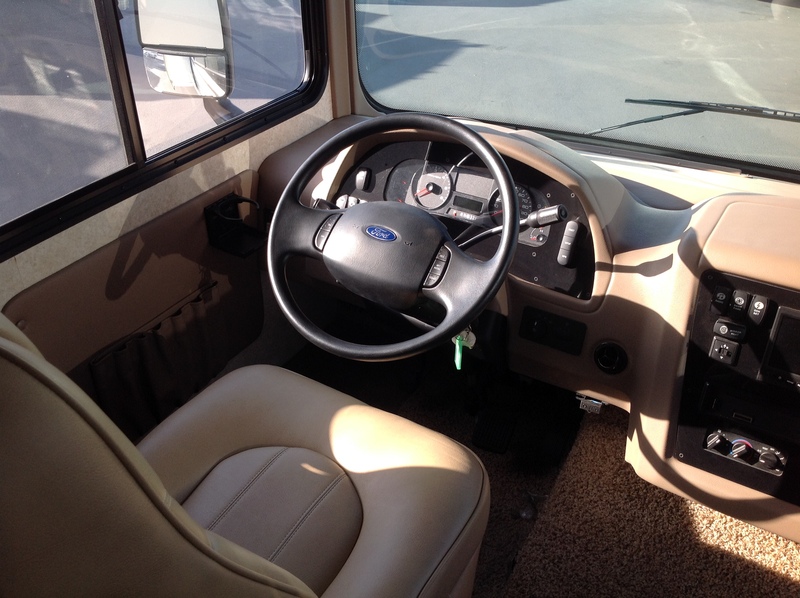 In RV Shopping Part 2, we described our trip to the Orange County RV Show, which was a dealer show. 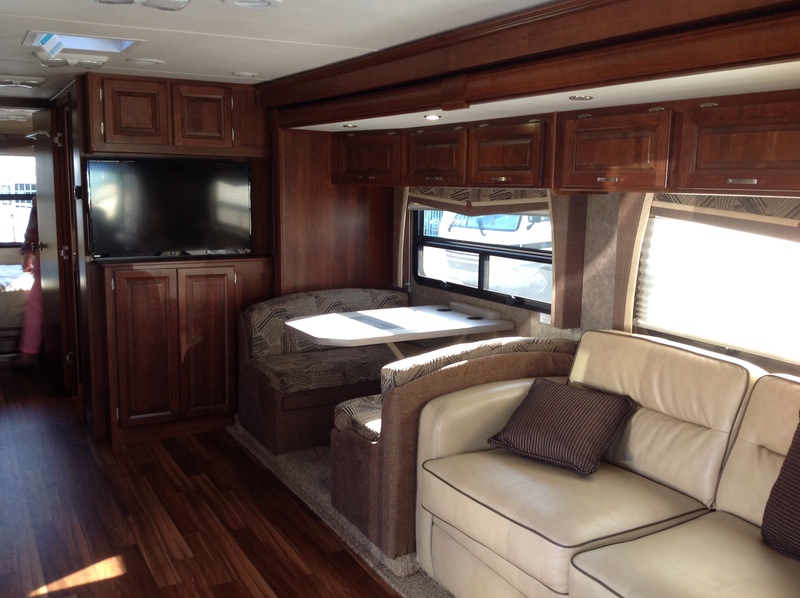 We looked at quite a few new coaches, and only liked one of them a lot – the Forest River Georgetown 329. We also looked at used Diesel Pushers for the first time, and looked at a few used Class A Gas coaches. The show was a good experience, which we enjoyed very much. After the Orange County show, we dived into some more intensive research. At first it was centered on Diesel Pushers……are they a good choice for us, what prices could we expect, maintenance and repair costs, and so on. We also learned a lot about determining value using the NADA Guide and other sources. Then we started to focus on the possibility of buying a new coach – could we afford it, what brands were the best for our price range, and so on. We wanted to sit down with a dealer and talk dollars on a new coach just to see what we could do, given the amount of money we could get out of our IRAs without taking a large tax hit. Buying a new coach has advantages and disadvantages. On the plus side, you get better financing terms, and you get a warranty. You also know that your coach hasn’t been lived in by anybody else, or abused by anybody else. On the bad side, you take a depreciation hit, and you have to go through the problem “shake out” that seems to be the norm on new motor homes. 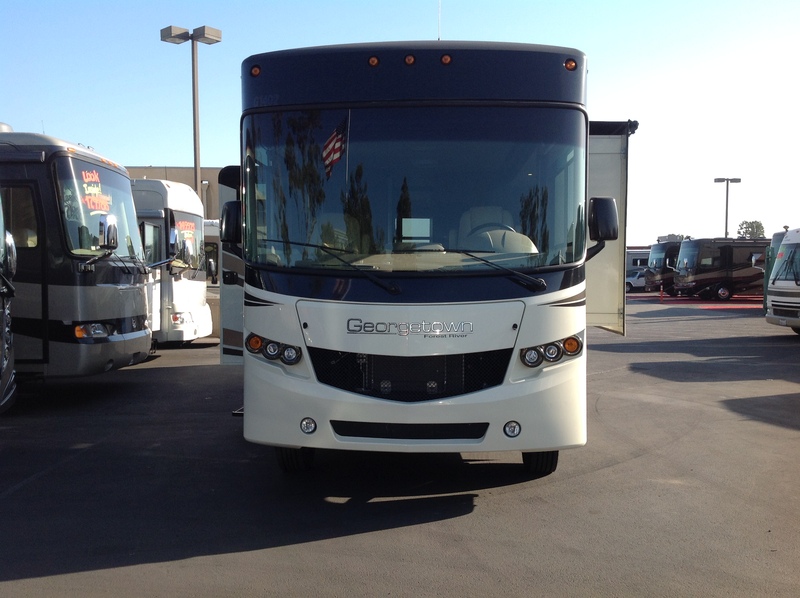 Our next shopping trip was up north – a dealership in Moorpark that sells new Newmar coaches and higher end used coaches, and a dealership in Thousand Oaks that sells new Itasca coaches and a wide variety of used coaches. The drive out to Moorpark was longer than I expected. From Redondo Beach, it’s the 405 freeway all the way through the Sepulveda pass and deep into the San Fernando Valley. Then there is a big left turn on the 118 freeway, and you are on that freeway almost to the end of the line. I think of this area as being closer than going down south because I did a commute in the same direction for 9 years, to the Santa Clarita Valley which is only a few miles past the 118. It’s very familiar to me. I tend to underestimate how long the 118 freeway is. This dealership is a small, family run company. They have very good ratings from customers, and the feel at this place is very good. They have no service facilities. 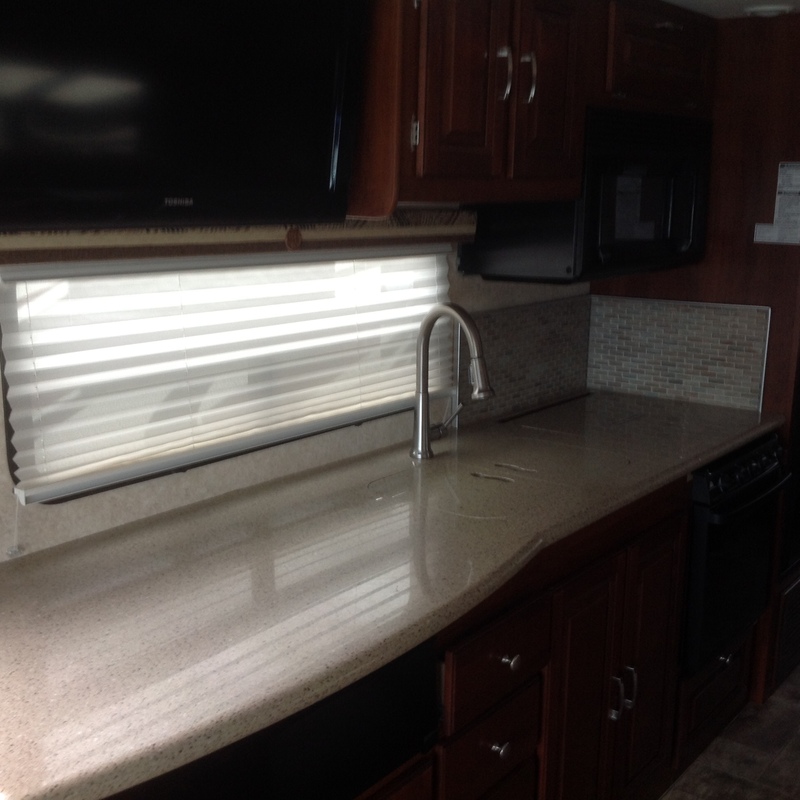 They sell the high end and very expensive Newmar line, which starts out with the entry level Bay Star line, and goes all the way up through 300K plus Diesel Pushers. These coaches are made in Indiana with support by the local Amish community (some of the Amish work at Newmar and others work at other vendors and as independent craftsmen). Woodwork is better than anything I’ve seen, even in the entry level Bay Star units. Tiffin comes close, but no cigar. Neither Laura or I thought that we would be able to afford a brand new Newmar, but there were some used coaches on their website that we were interested in. When we got to the lot, only one person was there – the yard manager. Very nice guy, and he did a good job of showing us coaches. Since we were trying to figure out financing options, we wanted to sit down with the somebody at this dealership and see what they could offer us for an entry level Newmar, even though we didn’t really think we could afford it. We weren’t able to do that. The yard manager isn’t allowed to work deals, and said we had to come back when the owner was there to talk money. We looked at four new coaches…the Bay Star Sport 2702 and the Bay Star Sport 2903 which are the lowest end of the Bay Star series, and two at the higher end of the Bay Star line – the 3124 and the 3308. The Bay Star Sport units were pretty, but too small. 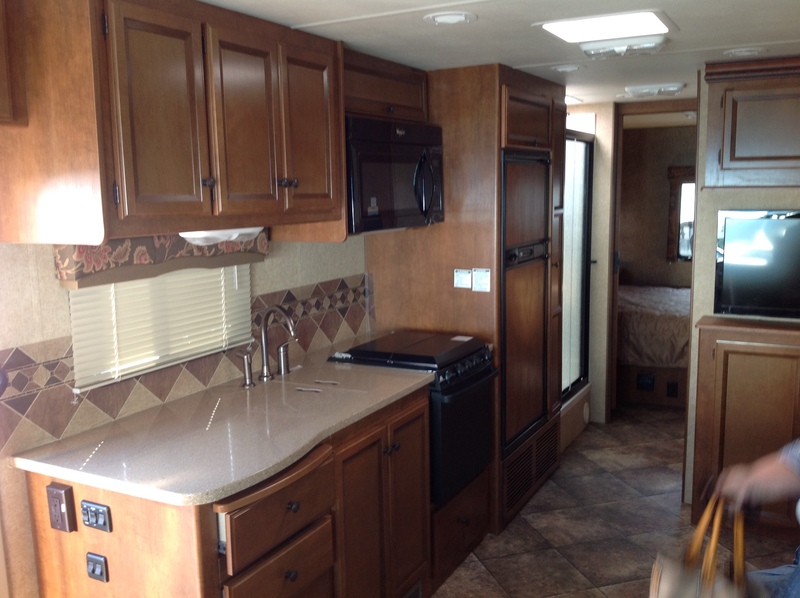 The Bay Star 3124 was a nice unit….a large step above the Bay Star Sport line in both scale and features. The Bay Star 3308 was a really nice coach, and we were quite taken by it. It was the right size and had almost all of the features that we wanted. We had a very limited financial conversation with the yard manager on the 3308. The MSRP listed on the sticker was $143,126. The yard manager said that this coach would probably go for the mid 120K range. That isn’t a good deal – it’s only about 12% off of MSRP. After that conversation, we went over to one of the used coaches we were interested in. It was a 2008 Monaco Cayman 35 Foot Diesel Pusher. The coach looked nice, but it was pretty well used, and it didn’t smell very good. Asking price was 99.9K. Low NADA for this coach is 69.8K. We asked the yard manager why the asking price was so far above Nada low retail, and he didn’t have a good answer. I also asked him why the Cayman had been for on their lot for so long (more than a month) with such a high price. His answer was that it was a Monaco coach, and since they went out of business before being picked up by another manufacturer after the 2008 crash, most people didn’t want to buy them. My first thought was to ask why they didn’t lower the price to compensate, but I didn’t say anything. I asked if they sold used coaches on consignment, and he said that they had a mixture of trade ins and consignment units. That might be what was going on with the Cayman….the private owner might not want to accept under a certain value for their coach. Laura and I sat in this coach while the yard manager went out to do something in the office. When he came back, he told us that the Bay Star 3308 was going to be put on sale for the coming weekend, for 115K. This is about 20% off of MSRP, which is the low side of normal discounts off of MSRP. It may be a decent price for a Newmar, but it is less of a discount than the 25-30% that is a typical for most coaches. He said we could call the owner and make an appointment to talk about it. We didn’t end up trying to tie in with the owner of this lot. It was pretty obvious to us that 115K was well above our price range, and even if we got them down to 30% off of MSRP, it would still be pretty tight. A Newmar just isn’t going to be our first coach. There is one bit of advice that I would give to the owner of this dealership. If you want to get more sales, hire somebody else that can talk dollars, and make sure they are on the property when you aren’t. We’ve been there twice, and missed the owner both times. Not good. You are leaving money on the table. A good salesman would have tried to work us down to the Bay Star 3124 or even a Bay Star Sport. It probably wouldn’t have worked with us, but it might work with somebody else in a similar situation. Moorpark and Thousand Oaks are a lot closer together than I thought. You just take Hwy 23. It’s about a 15 minute drive. There are two lots for the Thousand Oaks dealership, both on the same street. 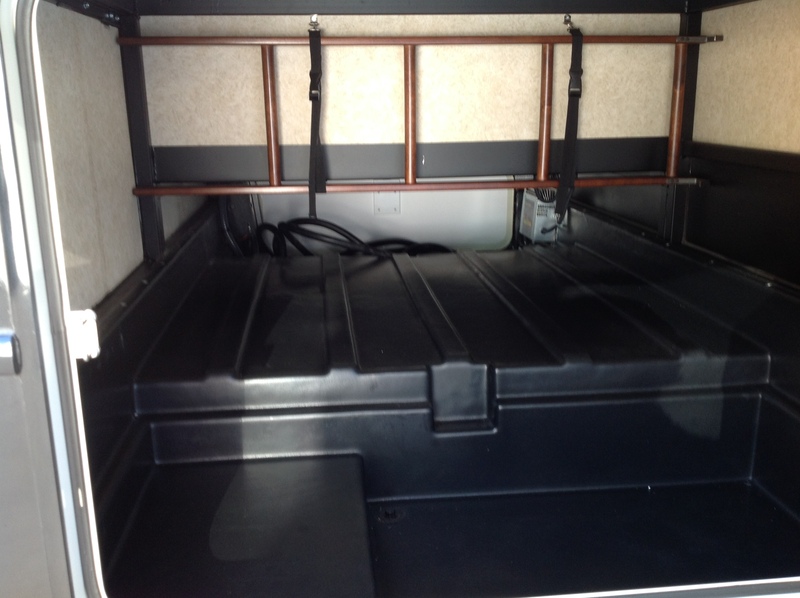 One has their lower end stock….used motorhomes under about 60K. 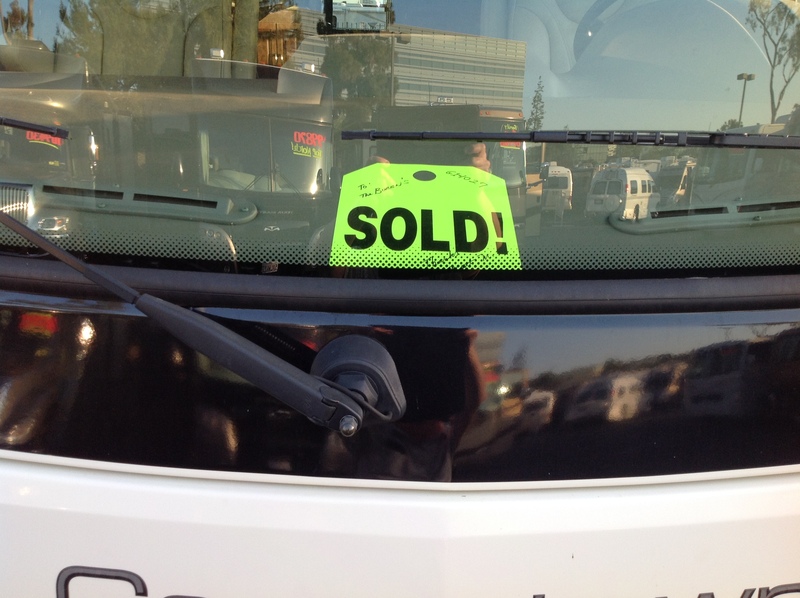 The other lot has higher end used coaches and their stock of new Itasca Motor Homes. Itasca is built by Winnebago. The lines are almost identical. Originally Itasca was a higher priced line, but that isn’t the case these days. We hit the low priced lot first. I didn’t like any of the coaches they had on this lot. I’ve been on their website pretty often, and their stock looks fairly good there, but they didn’t look so good when we actually went into them. I didn’t see one coach that I would consider. I’m thinking that many of the coaches here are traded in units that dealers didn’t want to sell. I asked the yard manager if their coaches were consignment. He told me that they owned all of them…..that tended to reinforce my suspicion here. They are buying used coaches on the wholesale market and trying to retail them. The high end lot had some interesting coaches. There were two Diesel Pushers from their web site that I wanted to see. One was a Fleetwood Discovery 40x. That one looked very nice. It was way over priced compared to the NADA low retail value, but I got the impression that this company would negotiate. There was only one thing that turned me off about this coach. Size. A 40 foot coach looks HUGE when you are standing next to it. I thought that something only 6 feet longer than the coach I rented would be no problem. I’m not so sure about that. We looked at one other Diesel Pusher that was on the website – a Safari Cheetah. This one was cheaper than the Fleetwood, but it didn’t look nearly as good, and it was also a 40 foot monster. It just didn’t feel right to me. As we were on our way out of there, we looked at a another gas coach that had just arrived – a Winnebago Sightseer. It was a 2010 model, and it looked pretty good. It had a very interesting floor plan. Laura really liked it. The manager of this lot said what he thought the price would be (89K), and also said it was around 35 feet long. It looked longer to me, so when we got home I looked it up. This coach is over 37 feet. I wouldn’t consider a coach that long with a gas engine. Too much weight to pull mountain grades. Over all, this lot was not bad, but all of the used coaches had some kind of issue. If budget forced us into an inexpensive coach, I’d give it a much harder look. Sorry there aren’t any pictures for this post. I didn’t take my own pictures….it’s more difficult to do when you have sales people breathing down your neck, but that’s not the only reason. With the exception of the Bay Star 3308, there really weren’t any coaches that appealed to me. I thought about pulling some of the pictures from the websites of these two dealers, but I don’t think that’s kosher from a copyright standpoint, so I opted not to do that. More in the next post with pictures this time…..another dealer show in Orange County. In Our Absence . 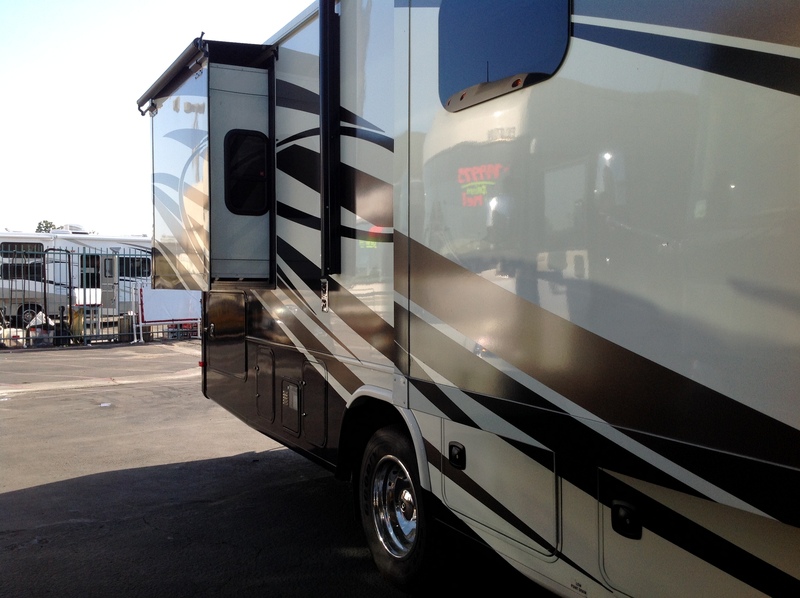 . .
Bob is busily writing about our latest RV Hunting which will be posted today and hopefully tomorrow. It’s in two parts. One problem with writing a blog that is centered mostly on our wanderings is that we’re not yet doing any big, or small, wandering quite yet. Continued to hunt the wild RV, which Bob will write more about. So we’ve actually been fairly busy. In addition to what I’ve listed, Bob is continuing his novel writing and I’ve gone down the rabbit hole on a few things, along with donating platelets to the Red Cross, going to the gym and dog walking, and enjoying finishing up American Horror Story, the return of The Walking Dead, and the Showtime three-month free pass we got from our cable company. Episodes, anyone?